We finished packing this morning and while the kids packed I settled with Sarah. We had a nice chat about our Derry visit and life before peace in this area. She told me that she used to be nervous when she’d visit the area during the Troubles. She is from England and Feeny is mainly Catholic. She agrees with me that it is going to take a lot of work on both sides if the peace is going to last. I spent a few moments writing a comment in the comment book of Roe Loft. I’d read some of the comments by guests that came before us, and found some of them moving. It’s hard to think of what to say in a guest book, but I managed to thank Sarah and Chris for their hospitality and tell them how special their home was. Then we said goodbye to Drumcovitt House. Clare ran around taking photographs of the house and dogs while we waited in the car, setting up the GPS to get us to Dublin by way of Belfast where I wanted to stop and see the CS Lewis statue and Little Lea, the house where Lewis lived as a child. The drive to Belfast was unremarkable. We were all tired and perhaps a little glad to be heading home. Well, Andrew was not glad since he had wrestling camp to go to a few days later. When we got to Belfast it took a while to locate the two landmarks we were seeking. We nearly gave up on the statue — Dean seemed very uncomfortable driving in the city. We drove around for a while, then found the road where Little Lea was located. Dean parked the car and we walked past the house and back again to the car, snapping two photos of the house. Because it is a private residence, I was a little shy about loitering for very long. I remembered reading about Little Lea in Lewis’ Surprised by Joy. The house is supposed to be what he based Professor Kirke’s house on in The Lion, the Witch and the Wardrobe. 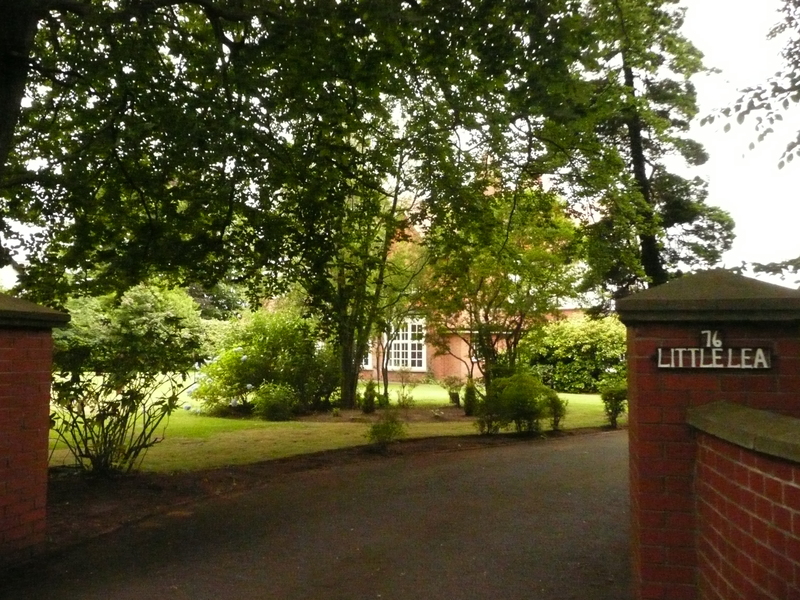 After seeing Little Lea, we drove around some more and eventually found the library where the C. S. Lewis Centenary Statue is located. We drove around for a while, then finally found a parking space but then we couldn’t find the statue. We drove around some more and then, because I’d already seen the statue as we passed and was about to give up on getting to actually touch it, when we saw that we could park behind the library. Whew! 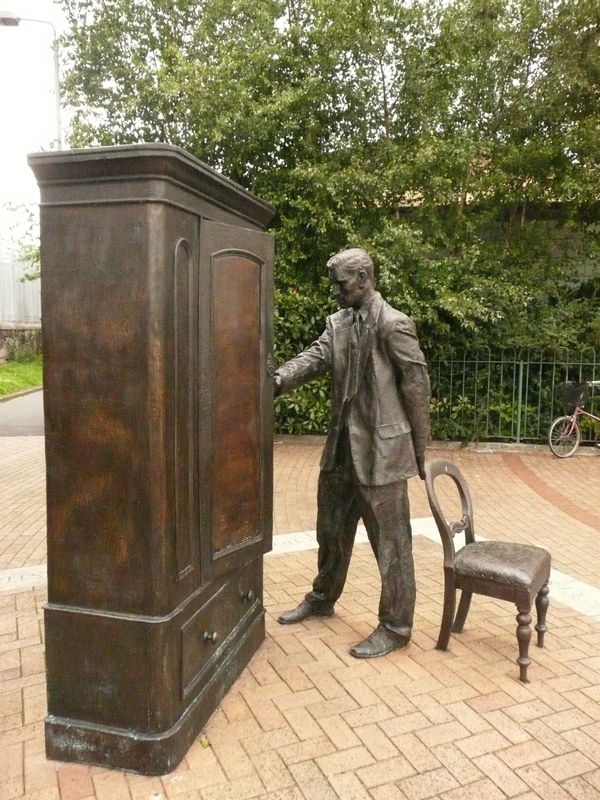 I remember when this statue was dedicated — the year Lewis would have been 100 years old had he still been alive. I was on the now defunct Mere Lewis list at the time and heard about it there. I never expected to see the statue in person because, after all, it was in war-torn Northern Ireland. Or so I believed, not having heard the news about the peace agreement. (I think I should read the news more often). 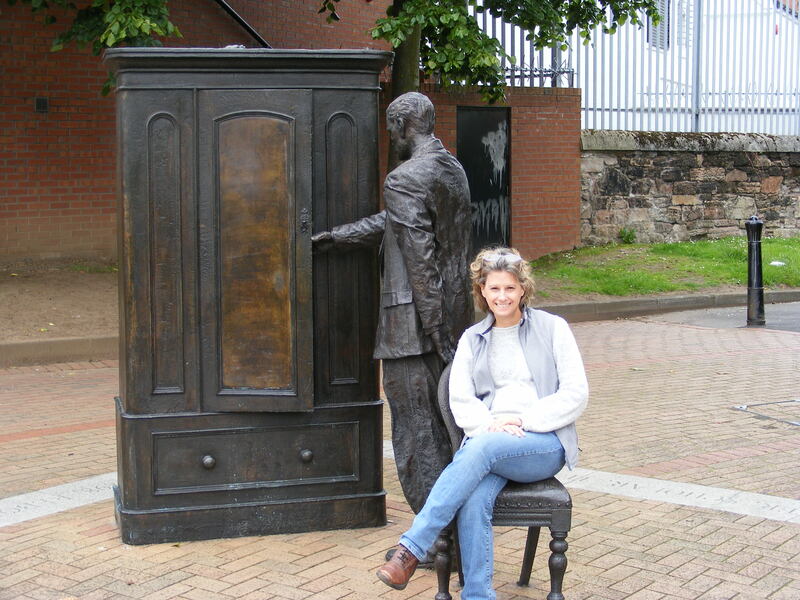 Anyway, we took some photos of the statue, Clare and I even posed in the chair in front of the statue. After the Lewis stops we drove towards Dublin on the biggest road we’d seen since we got to Ireland. We stopped for a picnic lunch in a dingy and depressing town of Newry. We checked into our hotel, the Ardmore, and had a little rest. Then Dean and I had a drink at the bar while the kids stayed in the rooms watching television. After that we all went down to the bar for a decent and long dinner. We’re staying in tonight although Dublin is not far away. I guess we are all travel weary. This morning, Dean and I explored the grounds a bit. 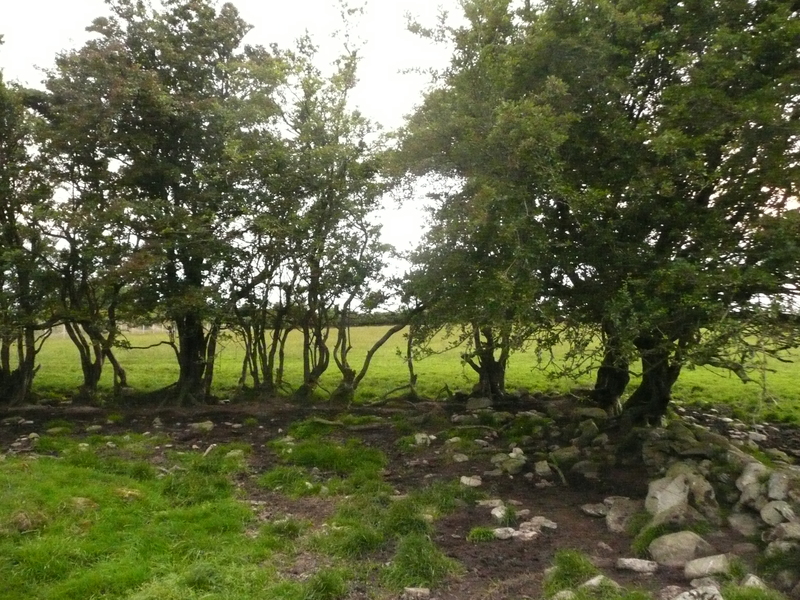 The [Fairy] Glen — this path takes you around and through pastures to the front of the house. It also takes you near an old cottage, to a stream and over a bridge to cross the stream. Part of it is overgrown, but that almost makes for more fun. The Fort — This path takes you through a couple of pastures to an actual megalithic site that once was used to corral cattle, according to Sarah. I’d like to think it was built by fairies — it is surrounded by hawthorn trees. 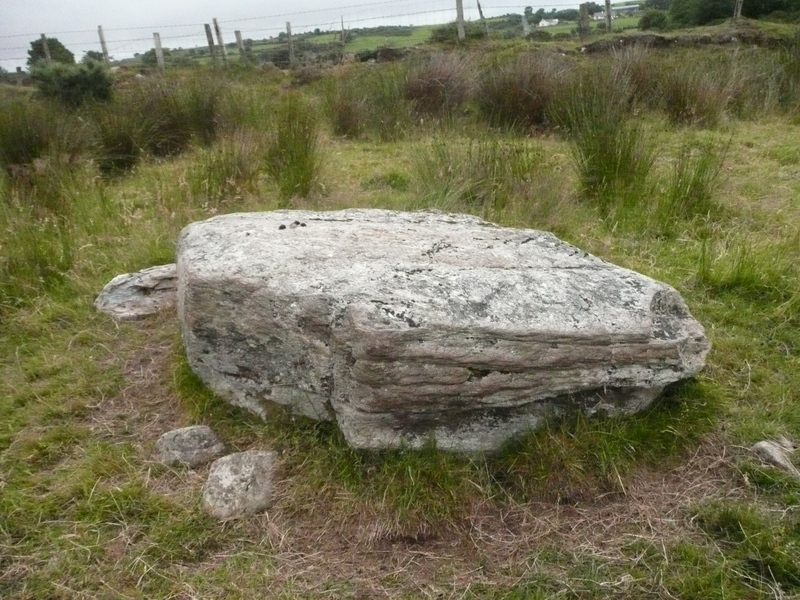 The Big Stone — This path takes you through pastures to a huge boulder in the middle of a pasture. Dean and I followed the path to the Fort and did some exploring there. It was muddy, but we found the fort after a few wrong turns. As I’d mentioned in an earlier post, the first night we took the Fairy Glen path and on the bridge, Clare, who was leading, saw a gray rump of an animal ahead of us on the bridge. She thought it was a goat, but there are no goats at Drumcovitt House. Sarah suggested it could have been a badger. Clare, later, tried to find the badger’s hole, and found some places that could have been where the badger lived. It’s slightly worrisome since I’d always thougth badgers as vicious creatures. After our walk we had breakfast and drove into Derry. As soon as we got into the city, we were approached by none other than Martin McCrossan himself, owner of the Derry City Tours. After a few minutes of discussion, we decided to go with him since there were only a few other people with him at the time. Unfortunately, later he picked up about 40 other people. Good for him at £4 a person, but bad for us. It was a good tour, and Martin was careful to tell both sides ot the story of Derry. We walked on the walls, he told us the old history of the town, as well as the more modern history. On some of the walls he told us that not so long ago we would not have been allowed to walk there. 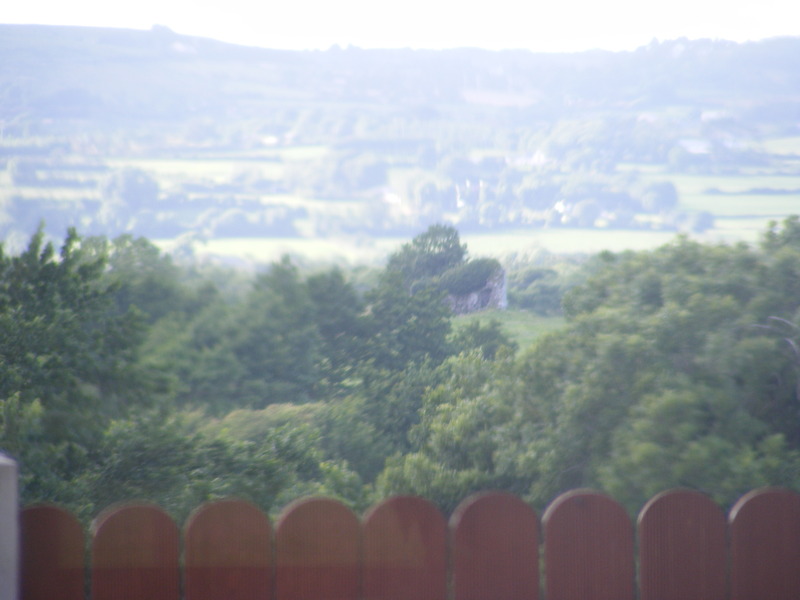 We saw the bogside in the distance, with the murals depicting the violent history of the area. Martin suggested we also visit the Derry museum and the Apprentice Boys museum. After lunch at a cafe he recommended, we walked to the Derry Museum. It was impressive and detailed. I now know more about the city of Derry than I ever expected to know in my life. 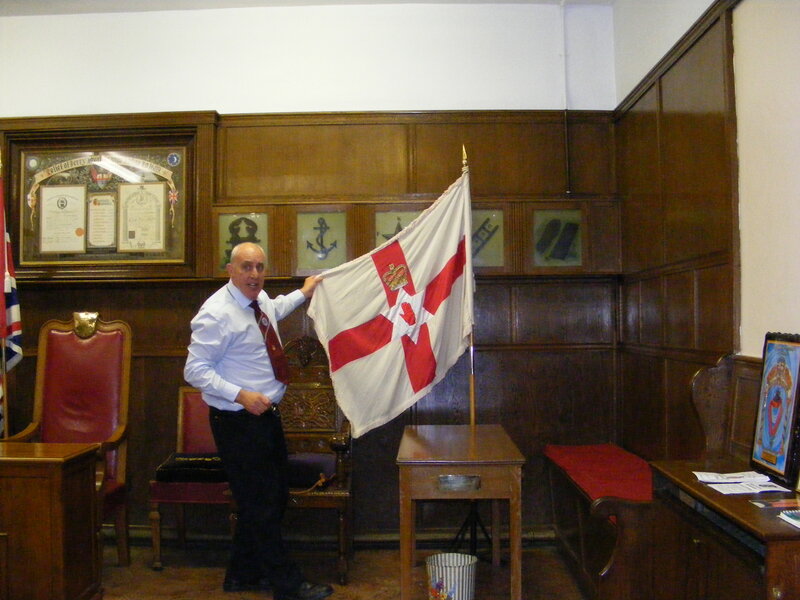 Probably the most interesting part of the day was spent inside the Apprentice Boys Hall. 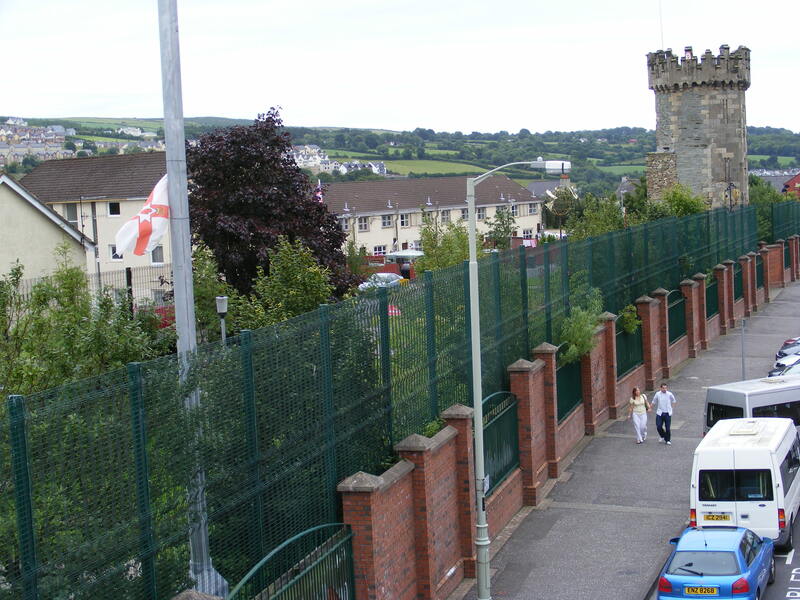 I’d never heard of the Apprentice Boys — a group of 13 young apprentices who, in 1689, during the Seige of Derry, shut the gates against KIng James’ army — but wish I had, because the story is so interesting. The Apprentice Boys is now an international fraternal organization celebrating the event in 1689. We thought we would just get to see a small museum in the hall, but the gentleman who met us at the door took us into most rooms in the hall. I have a feeling they don’t get many visitors — it’s not a very politically correct organization these days. We were shown, not only the Apprentice Boys Hall, but also meeting rooms for the Orange Order and the Royal Black Institution. 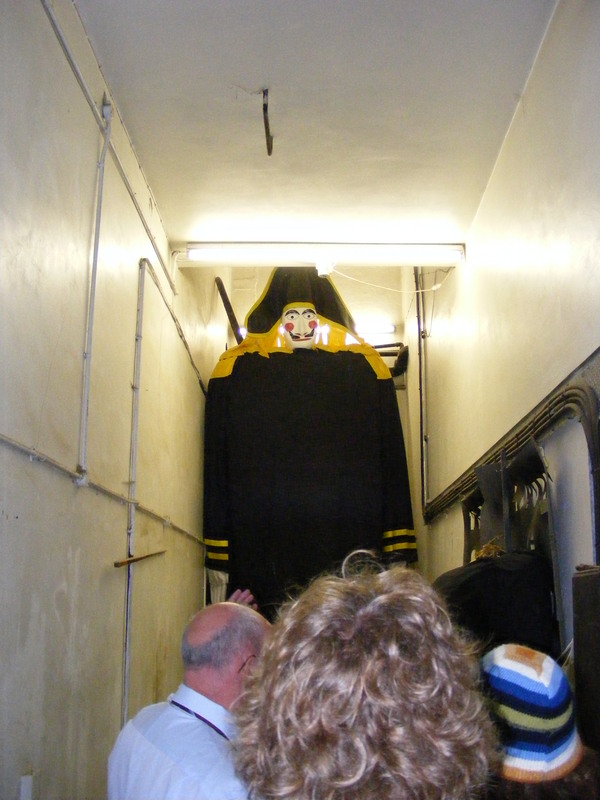 Our guide also showed us Lundy the Traitor that is to be burned in effigy on the second Saturday of December this year. After our educational visits, Clare wanted to do a bit of shopping. We didn’t realize that the city pretty much shut down at 6, so we didn’t get much shopping done. 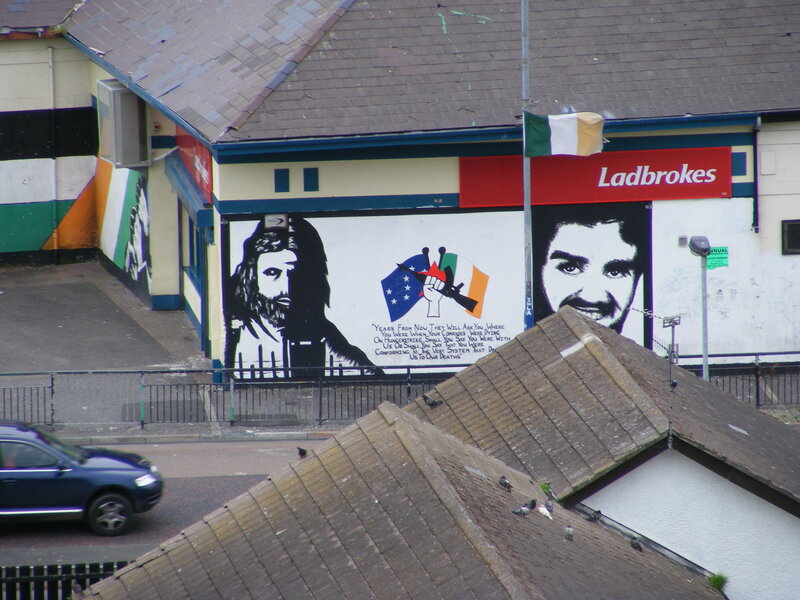 Dean and Andrew drove through the Bogside. After seeing the city of Derry, I was overwhelmed at its history, but I’m worried the peace won’t last. We stopped at a Tesco and bought provisions for dinner after our eventful day. Andrew and Clare are exploring the grounds and I’m going to start packing soon. As promised, the sun was shining this morning. 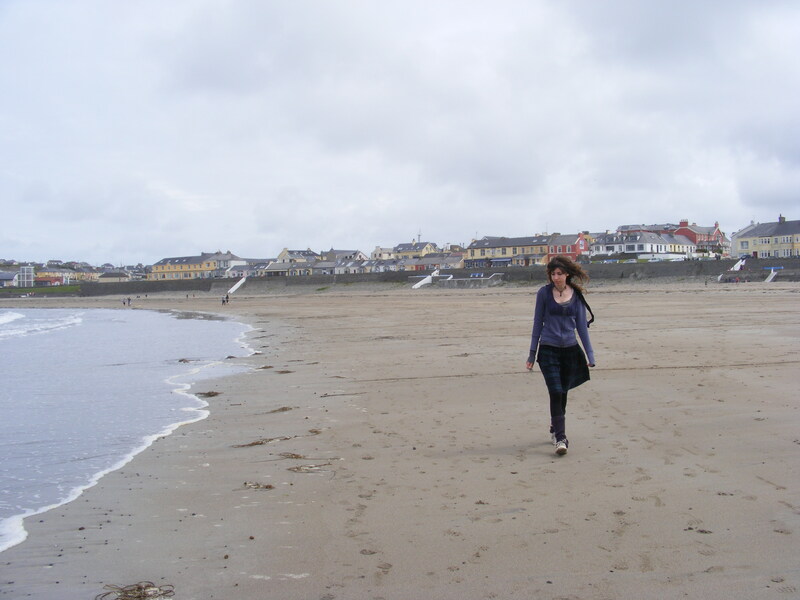 Sarah, the host of Drumcovitt House, thought it would be a good day to visit the Antrim Coast. 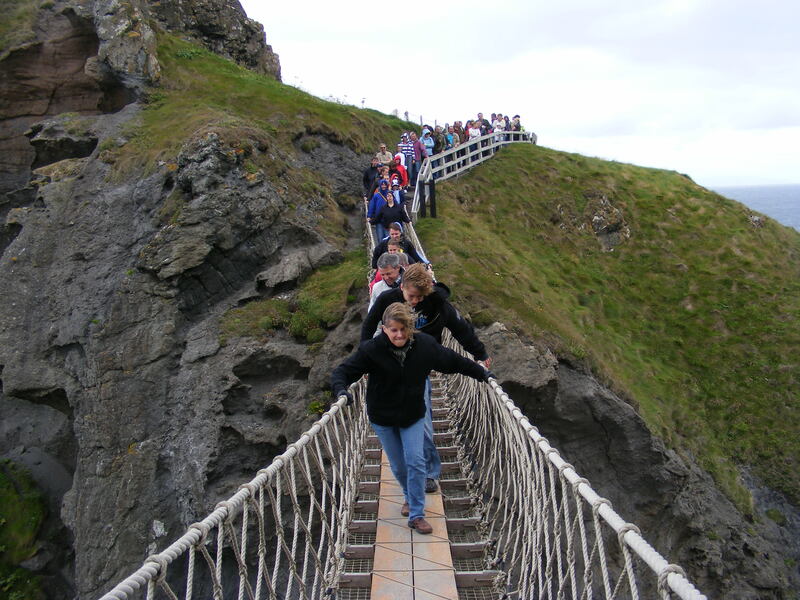 Our plans were to visit the Giant’s Causeway, then walk over the Carrick-a-Rede Rope Bridge and then drive down and visit the Glens of Antrim. Unfortunately we got a late start and the walk to and wait at the bridge was longer than we expected, so we didn’t get to the Glens of Antrim. It’s a pity because it looks like they are lovely. 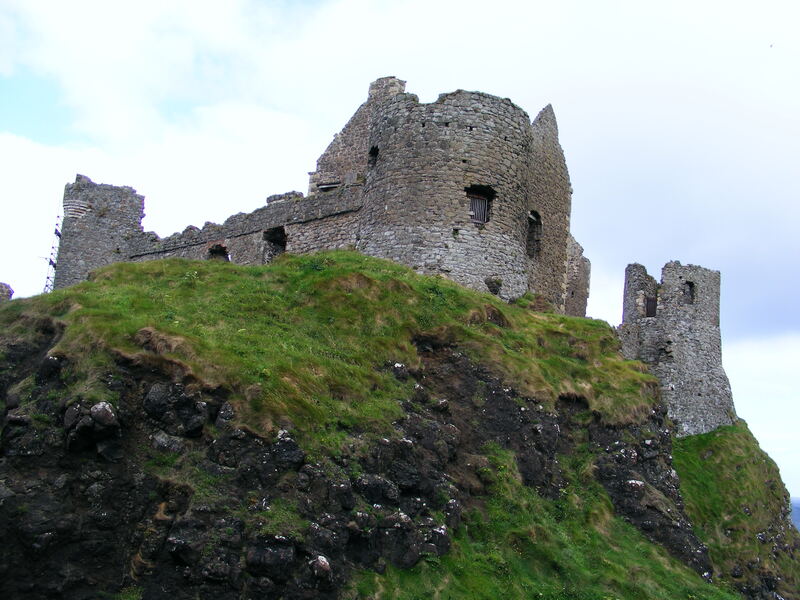 We drove north to Portstewart and drove along the coast, stopping for a few minutes at Dunluce Castle. 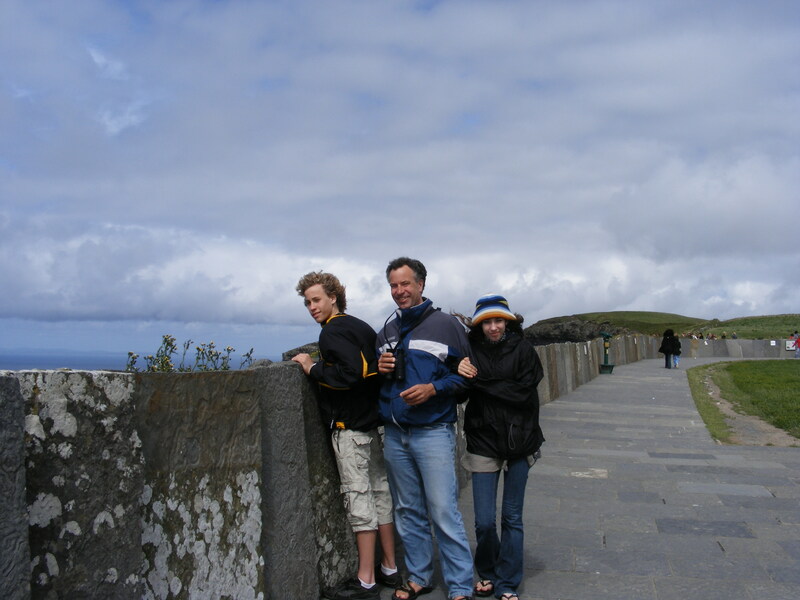 We also stopped in Bushmills for some reason — perhaps to buy drinks for lunch (and no, we skipped the whiskey) — then carried on to the Giant’s Causeway. 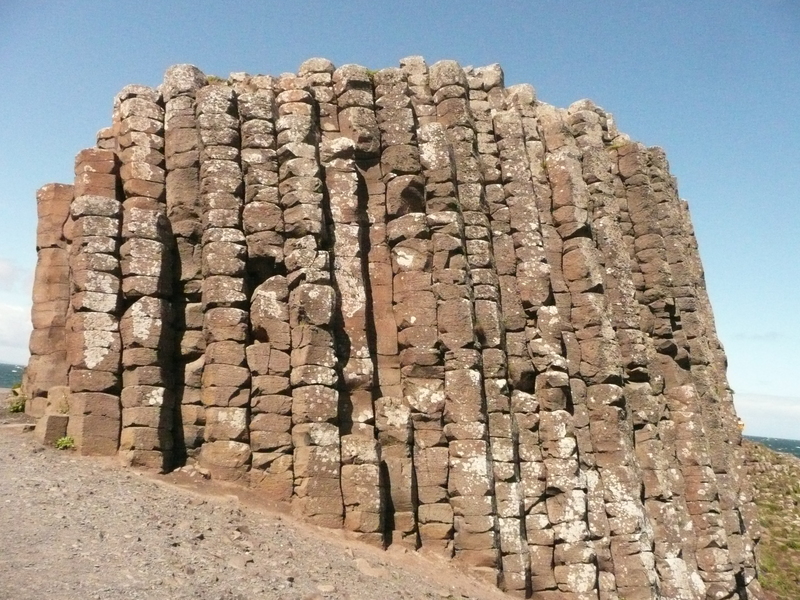 The Giant’s Causeway was formed when the Giant, Finn McCool (Fionn mac Cumhaill) built it to fight the Scottish giant Benandonner. When he saw the size of Benandonner he ran back to Ireland and jumped into a pram. 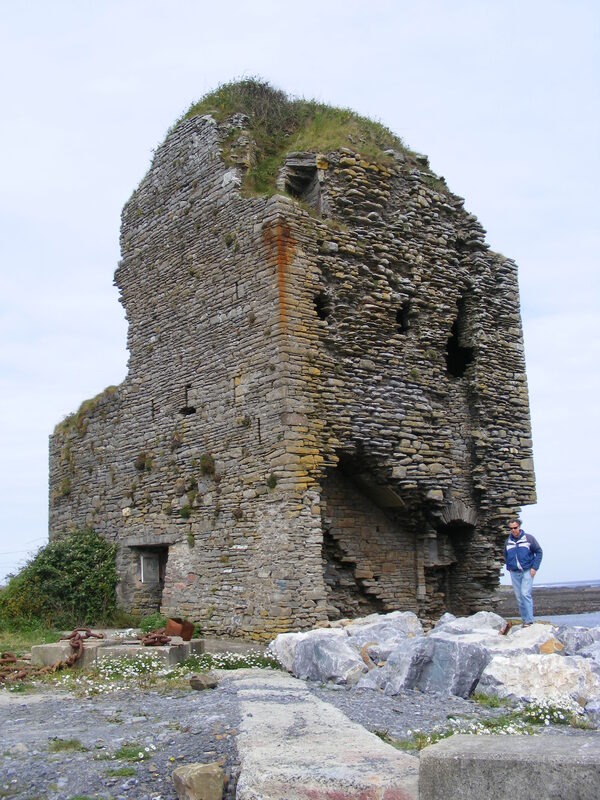 Benandonner chased Finn into Ireland and when he saw Finn in a carriage he thought, “If that’s the baby, I don’t want to meet the dad.” Benandonner then ran back to Scotland and broke up the bridge. Some people, however, say the causeway was formed by a volcano. 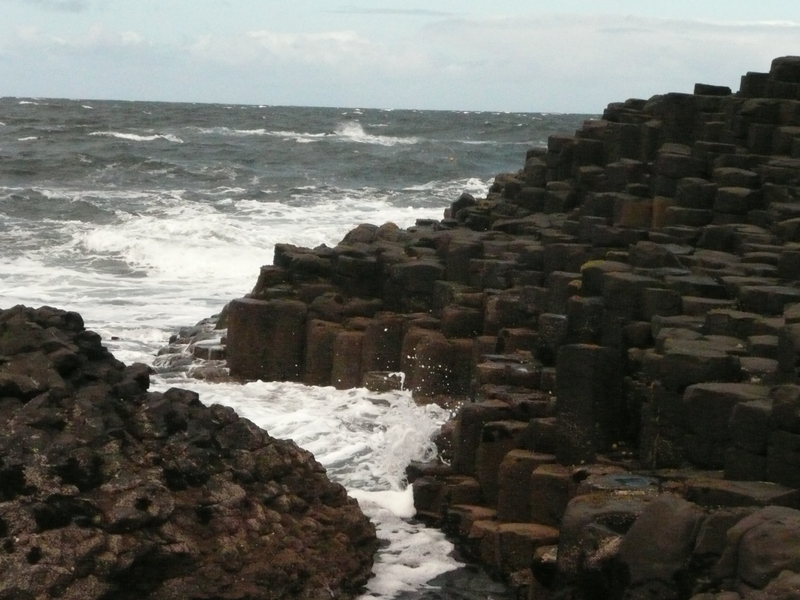 It is unique in that it is made up of tens of thousands of mostly six-sided basalt columns that form stepping-stones that eventually fade into the sea. This is one place I never thought I’d go in my lifetime, so it was pretty special that I was finally there. On our visit to Scotland a few years ago I especially wanted to visit Fingal’s Cave becasue I figured it was the closest I’d get to anything like the Giant’s Causeway. It looks like the setting of a movie that takes place on Mars — that’s how alien the landscape is. After walking around the causeway, marveling at the sight, snapping photos of the columns and even seeing Scotland in the distance, we were hungry for lunch. One of our guides to Ireland mentioned a picnic area atop a sea cliff just down the road, so we drove there and ate a picnic lunch of our usual bread, cheese, fruit and soft drinks. 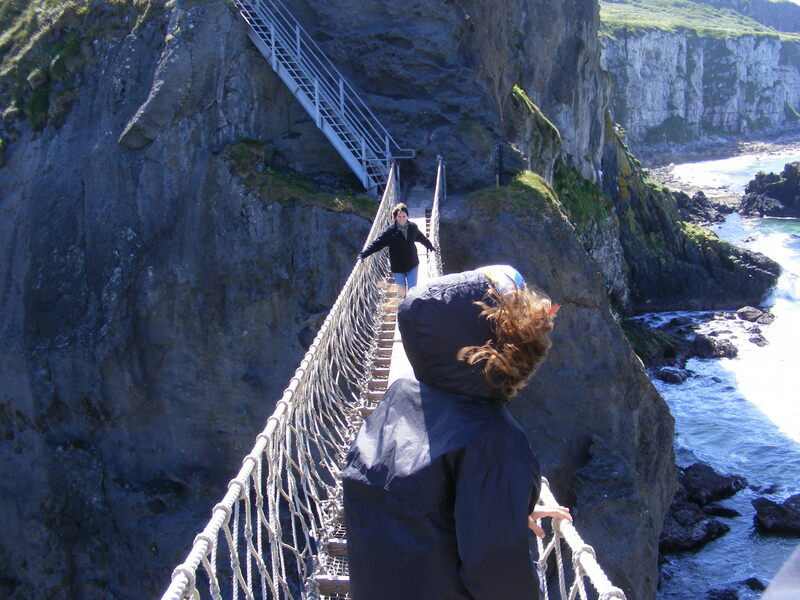 After that we drove back a bit to the Carrick-a-Rede Rope bridge. 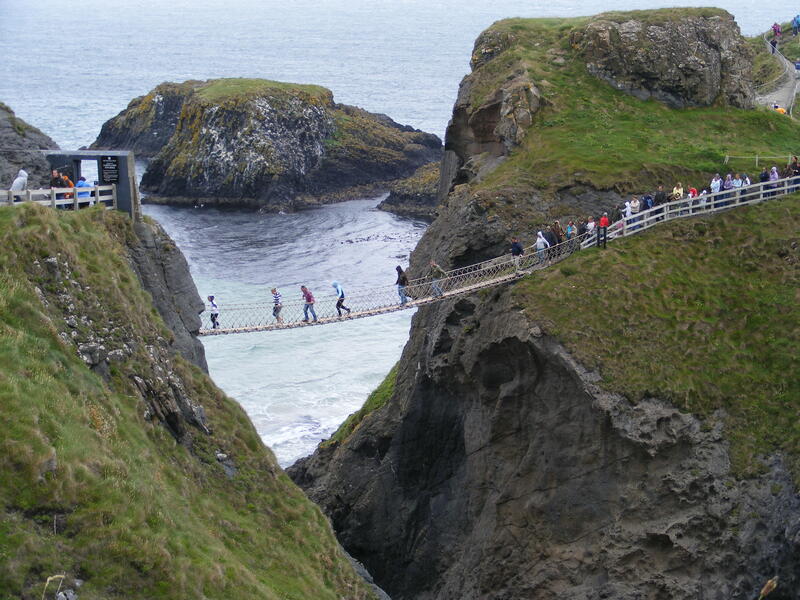 Over 300 years ago fishermen strung a rope bridge between the mainland and a tiny island about 65 feet off shore. They would use this bridge to get to the island which was where the salmon came round the coast. The fishermen don’t use this anymore, according to Wikipedia, but lots of tourists do. 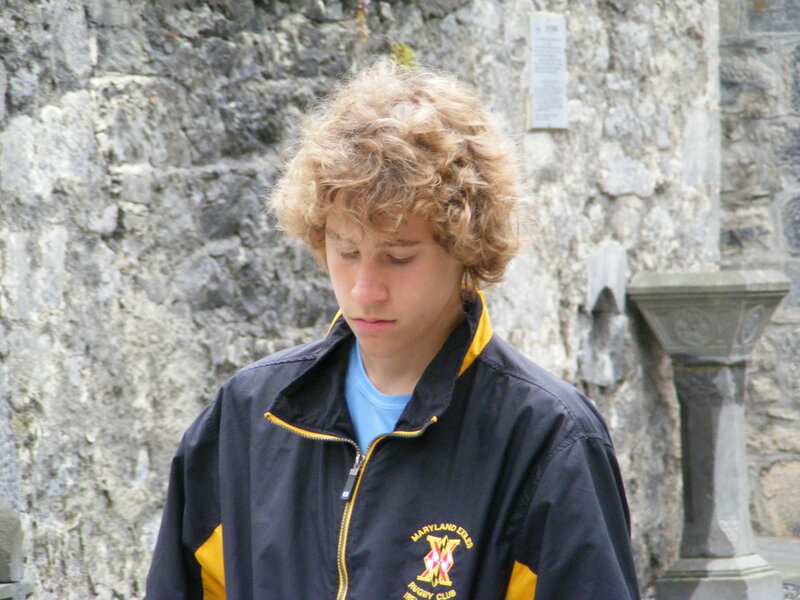 I’d first heard about this when Andrew’s rugby team went to Ireland — they were scheduled to cross the bridge. I thought he’d like to do it this trip, but I was not planning on going with him. I knew Clare’d get a kick out of it too, and suspected Dean would want to go. When we got to the bridge, after a small hike through beautiful landscape, I decided, why not? The bridge was not as long as I thought, and I’d heard there were some interesting birds on the island. We stood in line for a bit, then we each went across — the sign said no more than 8 people on the bridge at a time. I would have liked to cross alone because other people made the bridge bounce. It was pretty darn scary. Really. I never looked down — the kids said they did. I just looked straight ahead while the wind buffeted the bridge and the folks on the other side watched us walk towards them. Here’s a link to a YouTube video of someone crossing the bridge. They weren’t afraid to look down. 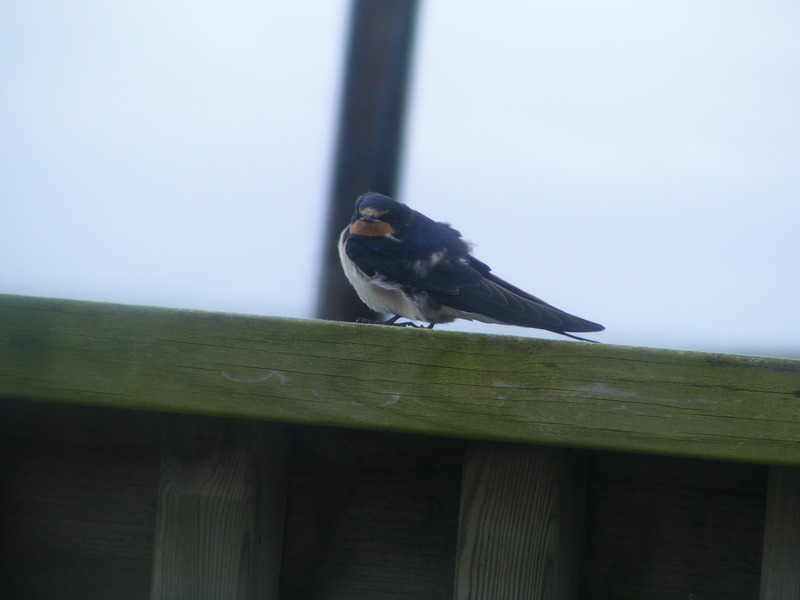 We walked around the island – it was very beautiful and we saw a few birds — razorbills, shags, gulls, guillemots, and other sea birds I couldn’t identify. 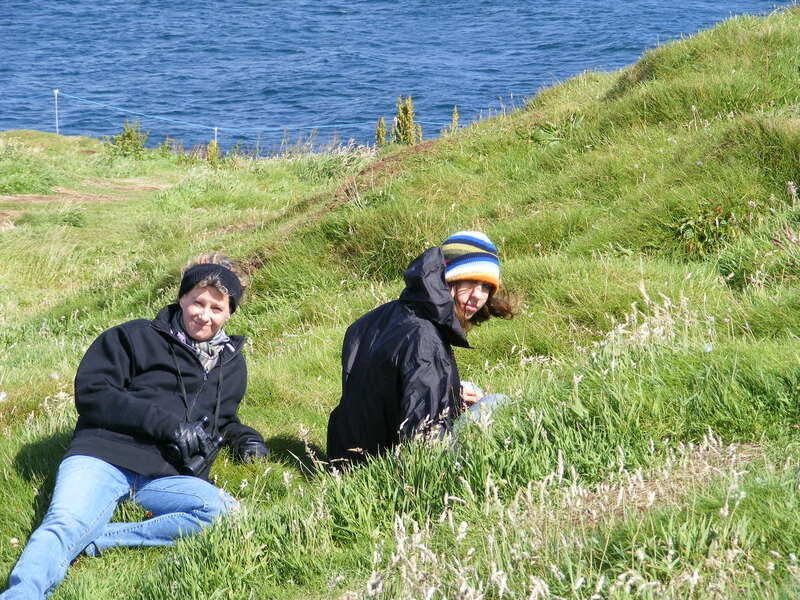 Clare and I lay down on some soft tufts of grass for a while. I tried to not think of the journey back. Finally we decided to get in line to go back. 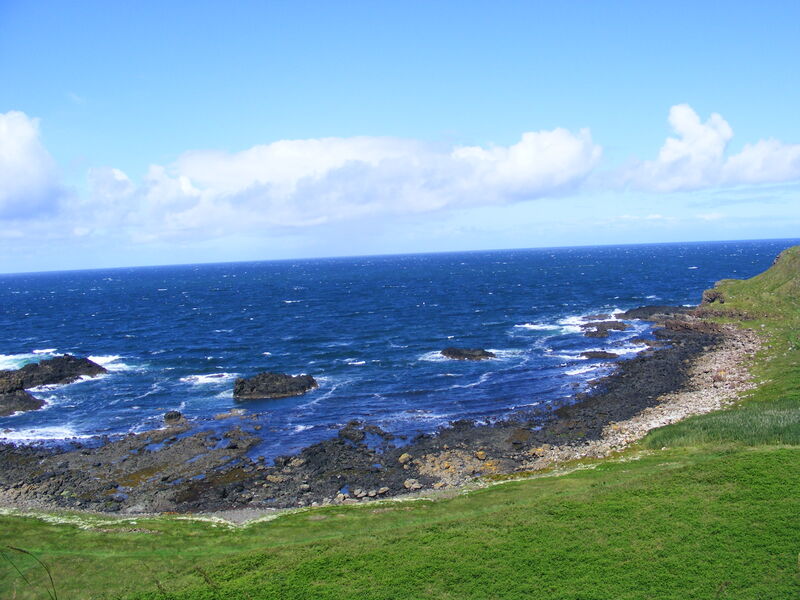 The wait was not so bad because I watched a shag or cormorant dive in the sea below us. When it was our turn to go, we noticed that the wind had picked up and the people ahead of us were being blown more than before. 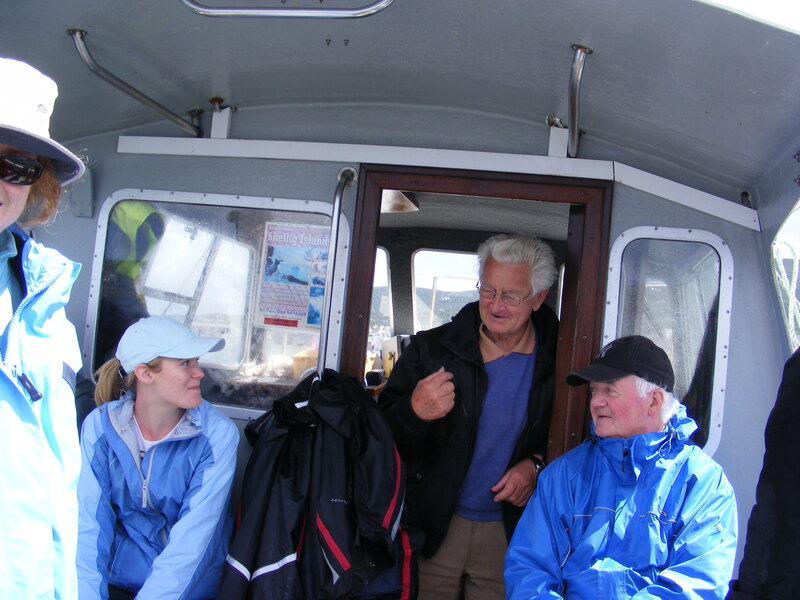 The trip back was worse than the trip to the island and sea spray reached us from below. Clare and Andrew thought I was funny, being scared and all — but Dean said he was too. It was definately the scariest thing we’d done on the trip — even worse than the boat ride to Skellig Michael or Dean’s driving the first day. We opted to head back to Roe Loft and explore the grounds instead of going onto the Glens of Antrim. Dean and I went to a pub in Feeny before picking up some carryout for dinner while Andrew and Clare explored Drumcovitt House grounds again. More Day 16 photos on Flickr. One of the things Andrew wanted to do most of all was to go scuba diving while we were in Ireland. He’d never mentioned the desire to scuba dive before, but was really keen on doing it in Ireland. So Dean, being a water lover himself, set up a scuba diving lesson and actual dive for him and Andrew for today. 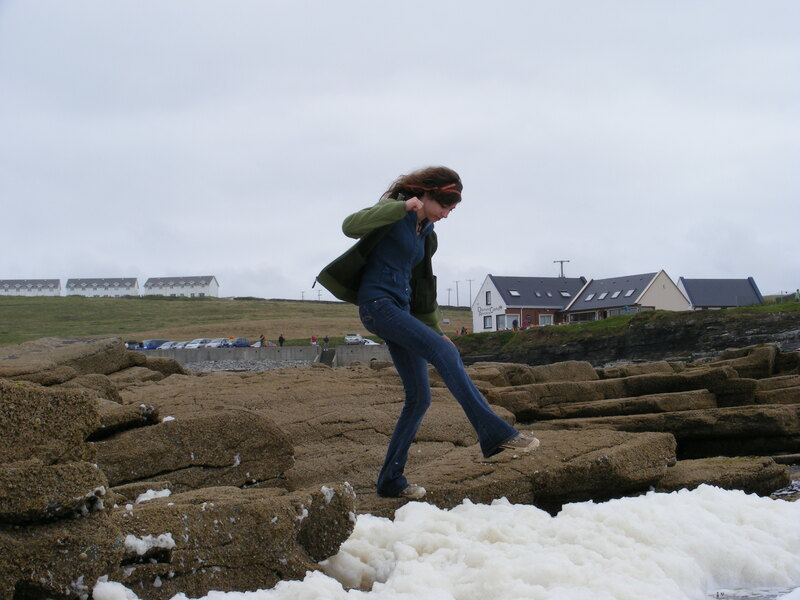 Clare and I should have asked to be dropped off in a market town or something — or even left at home, because, while we expected to go shopping in Kilkee while the guys went scuba diving, we soon discovered that Kilkee is not a market town. 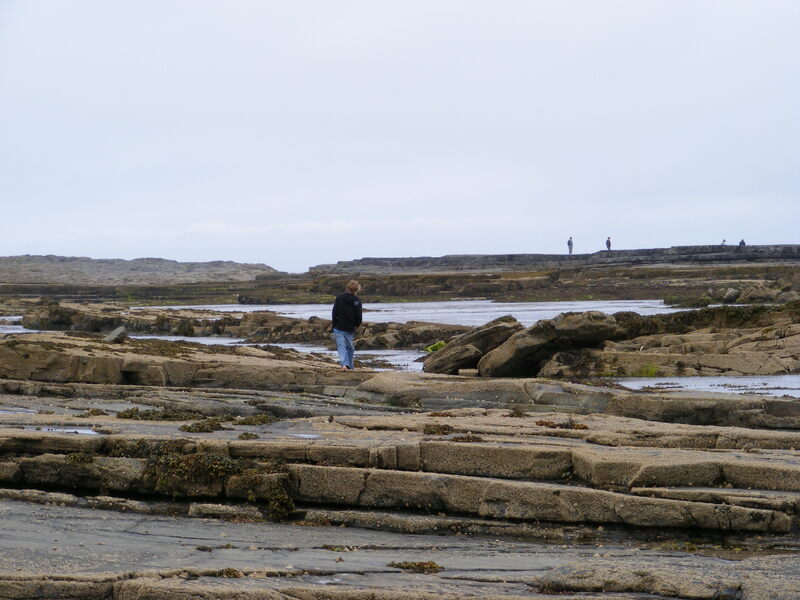 When we got to Kilkee this time, we accompanied Dean and Andrew to the scuba diving place. 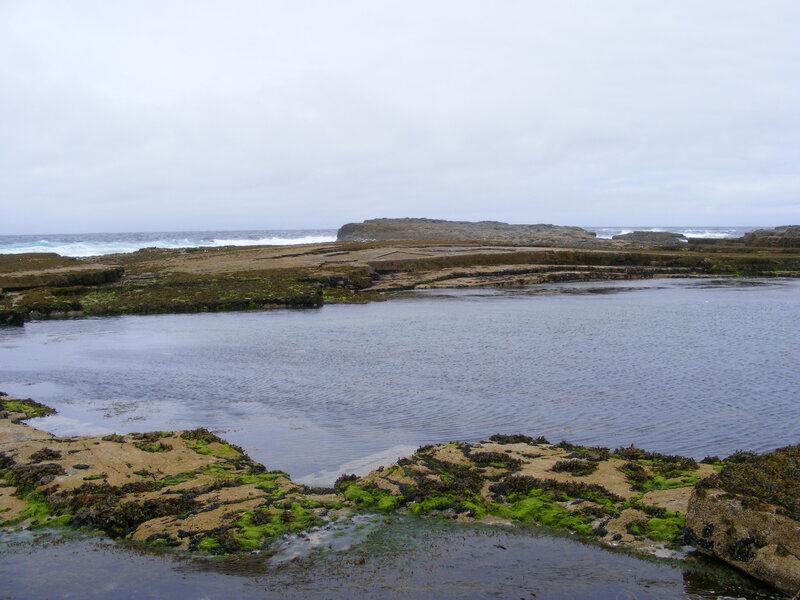 Kilkee is supposed to be the best place to dive in Ireland, so they made a good choice. The guys at the scuba place told Clare and me that they had room in the class for us, but we politely declined and said we were going shopping. An elderly and unkempt gentleman, who seemed to be there for the free coffee warned us that we’d find no shops in Kilkee. Kilkee was not a market town. Clare’d had enough of walking on the beach on Wednesday, so she didn’t want to do that. 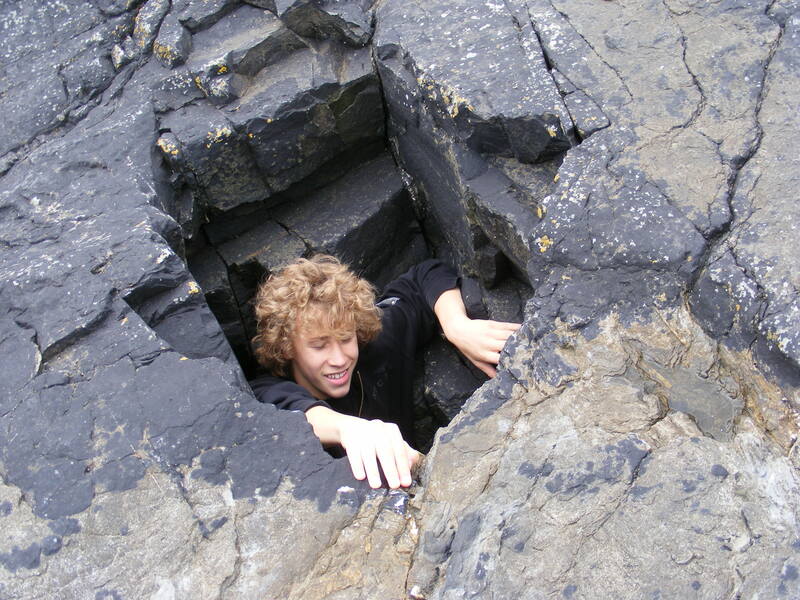 I didn’t want to walk on the rocks because I’d been scared last time, when Dean was around. We ended up walking up and down the main drag. It had a few shops — a couple of small stores with tacky clothes and one or two with plastic toys for entertaining young children at the beach. We found one shop that had a few books. Clare bought a signed copy of a book about fairies by a local author, so it wasn’t a complete waste. After walking up and down that street we decided to hang out in the car for a while. Clare read her summer reading for school and I watched the people on the beach. After what seemed like hours…oh yeah, it was hours…the guys came back with tales of their adventures scuba diving. We then ate a delicious lunch of sandwiches purchased at a local deli while sitting on a bench overlooking the beach. Andrew and Dean wanted us to see where they went scuba diving, so we drove around town to a really cool place that Clare and I would have gone to had we known it was there. There were tide pools galore! 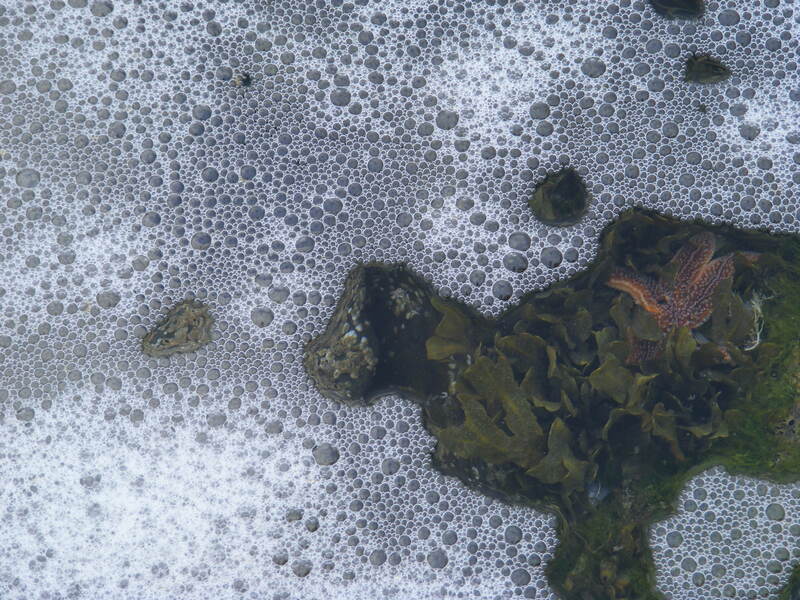 In fact the tide pools were so huge that they were where the guys went scuba diving. 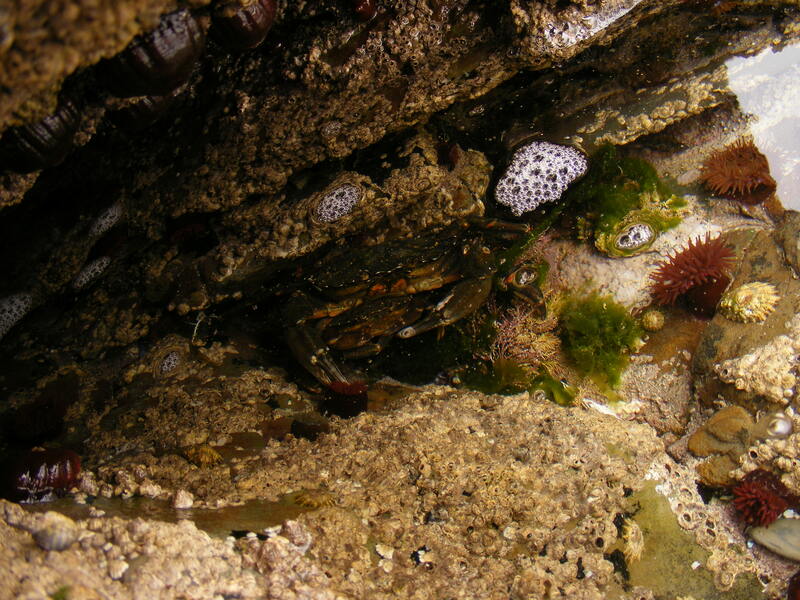 We spent a while exploring the tide pools and Clare took some great shots of some crabs under just under a bit of rock. We also had fun with the sea foam. If you’ve ever read the real version of The Little Mermaid, you know that when mermaids die their souls don’t go to heaven, they turn into sea foam instead. So I always call sea foam, dead mermaids. After wandering around for a while we realized the tide had come in and we were slightly stranded. Dean carried Clare through the water and was about to come back for me, but a young couple encouraged me to take off my boots and wade through the water. I was afraid the barnacles on the rocks would hurt the bottoms of my feet, but they didn’t and the water was not that cold. 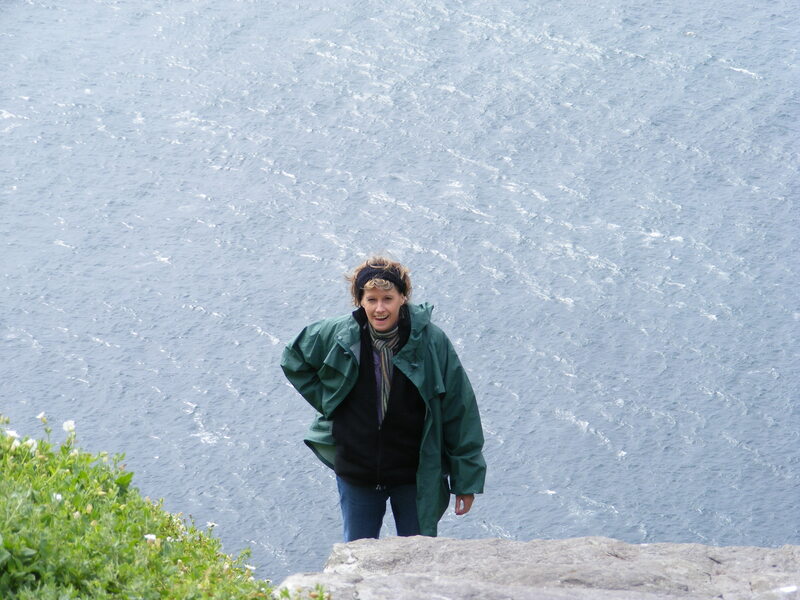 When we got to the other side someone joked that I’d walked across the Atlantic Ocean. I guess I had. 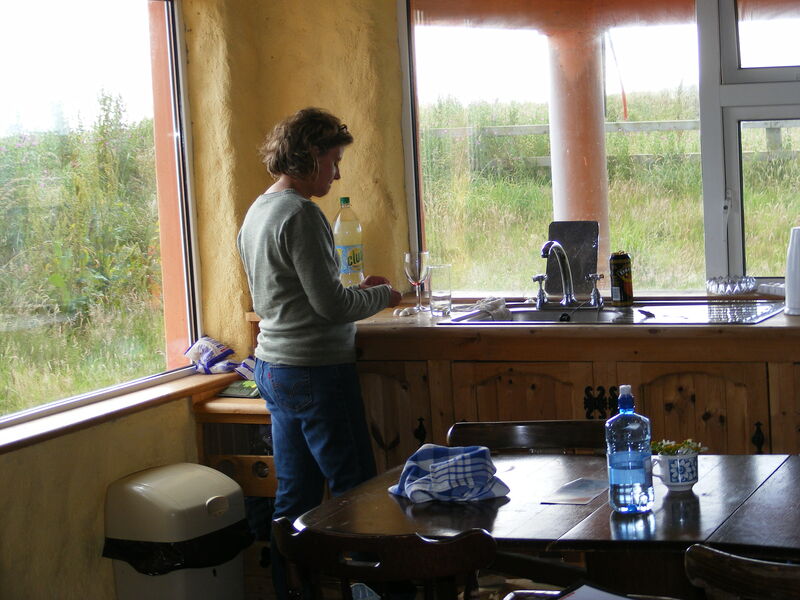 We returned to Parkduff Cottage and I cooked a delicious salmon meal. I’d seen fresh fish for sale in a “victuallers” shop in Kilkee and bought a couple pounds of salmon. I braised it in a lemon butter – garlic – rosemary broth and sliced up some carrots which steamed on the top of the salmon while it cooked. We had it with rice and a salad. It was truely wonderful. Very fresh. At the victuallers I asked the butcher why it was so hard to find fresh fish in Ireland. He told me that the Irish who lived by the sea wouldn’t eat it to save their lives. In fact, during the great famine people would die rather than eat fish. He said that folks inland ate more fish. I’d actually heard that story before, but thought it an old wives tale. Gregory came by to settle our bill before supper. He disagreed with the butcher’s theory. He said that the Irish were sick of fish because that is all they had to eat. That evening I took a few photos around the cottage to remember it by. 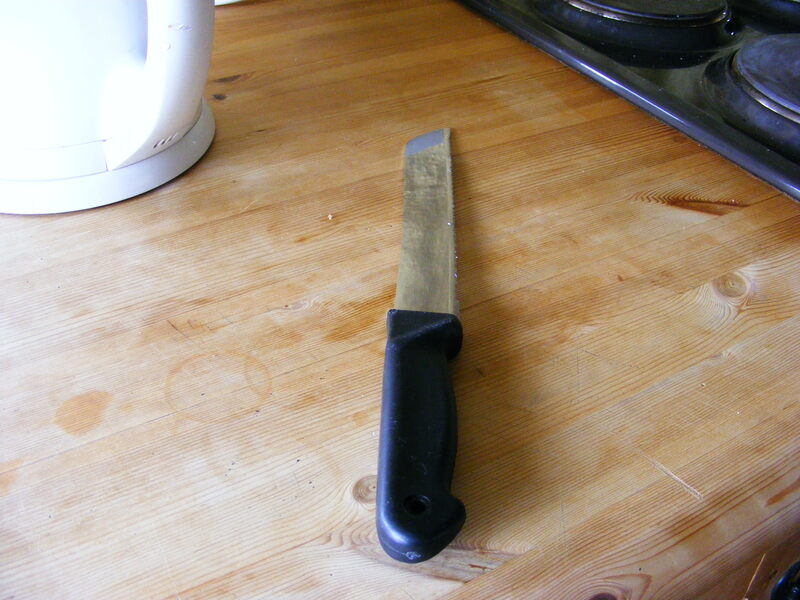 I forgot to take a picuture of the exactly 4 forks and butter knives, but I did take photos of dust, cobwebs and the one sharp knife in the house. They had a killer pan though. More Day 14 photos on Flickr. Today we had a very lazy day. 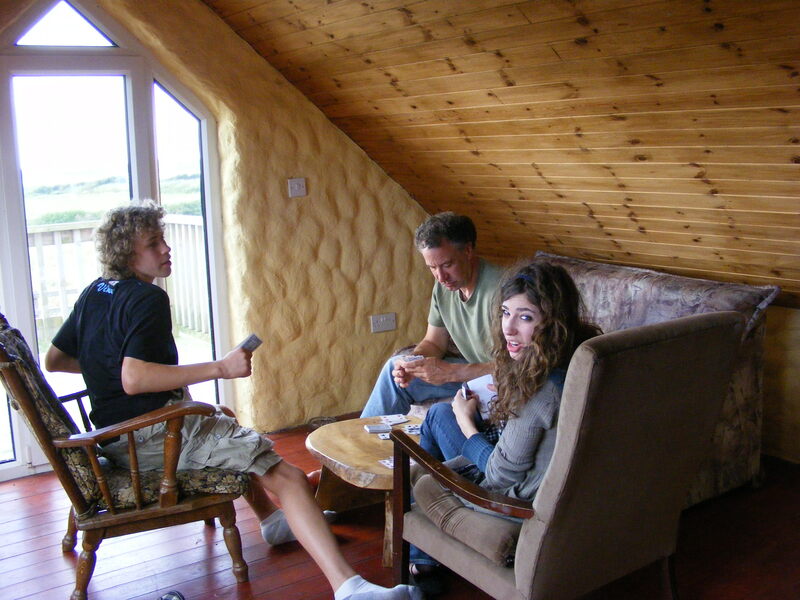 Dean and the kids played several games of cards in the morning. 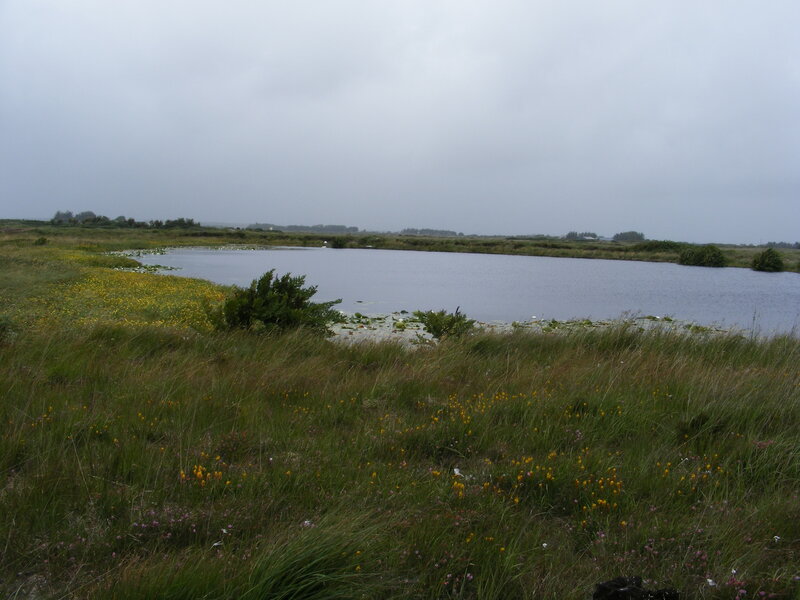 I’d wanted to visit a bog while in Ireland, so I researched it on my Sidekick and discovered that Tullagher Bog, a nearly pristine and the last remaining raised bog in County Clare was closeby. We tried, unsuccessfully, to find it, based on some coordinates online, but ended up having to ask at a shop in Doonbeg. Neither of the two shop girls had heard of it, but a customer was able to give us directions. I’m sure they all thought we were wacky Americans. We found the bog and explored for a bit. There was a small lake or pond where we were with lily pads. 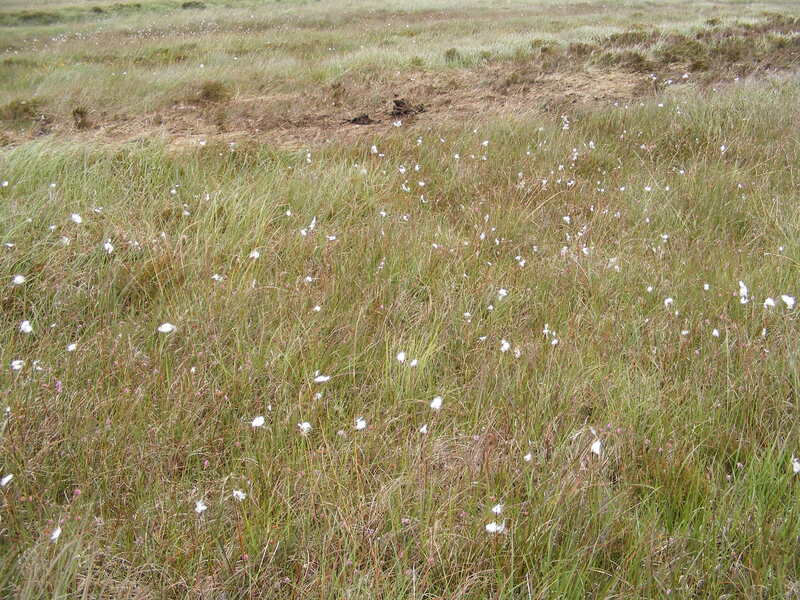 We also saw bog cotton and heather and a funny looking plant that I don’t know the name of. 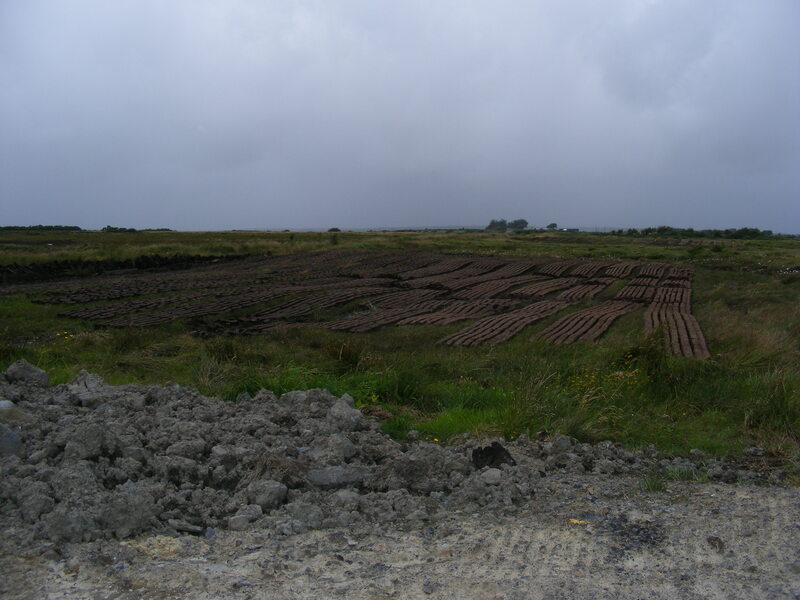 We also saw evidence of stripping the bog for peat for fuel. 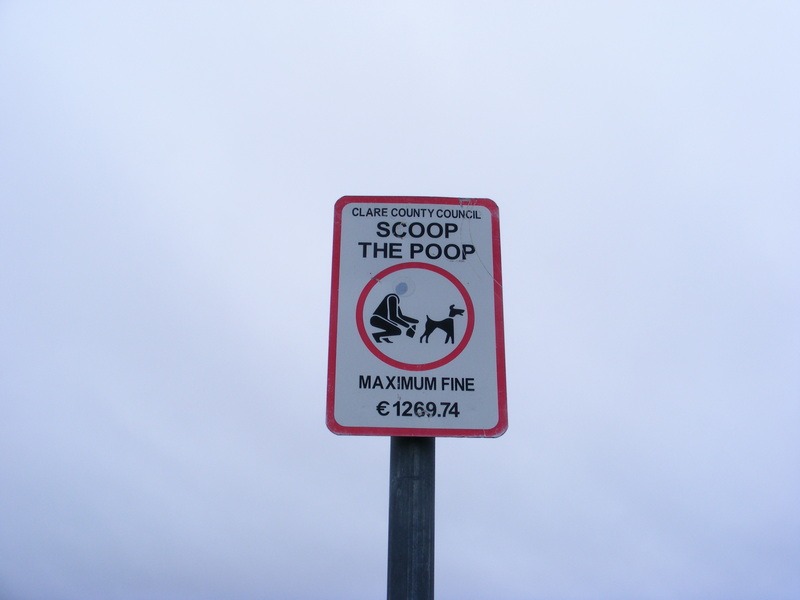 I’d read that this was controlled at this particular bog. I wish we could have spent more time here, but the weather turned a little nasty and Andrew was bored. We drove around after that, then returned to our cottage. After a lunch at home (packaged creamy vegetable soup — I need to find that in the States) Dean and I napped for a while. That evening we went out to dinner at a local restaurant, Morrisey’s Seafood Bar & Grill, known for its delicious seafood. The reviews were correct. We spent €100, but as it is probably our only dinner out (except in Dublin on Tuesday night) we felt it was OK to splurge. We considered going out for Celtic music after dinner, but ended up watching a silly Jack Black and Ben Stiller movie called Envy instead. More Day 13 photos on Flickr. This morning we had a late start because an electrician stopped by to fix the hot water. While he worked, he chatted about his visits to the States, including a visit during the terrorist attacks of September 11, 2001. After the electrician left we drove into Doonbeg to see if anyone sold fish. I’d read that one could buy fish from fishermen who landed at the pier. We walked out on the pier, but didn’t see any fishermen. It was just as well because we wouldn’t know what to do with a fish that hadn’t been gutted and skinned. 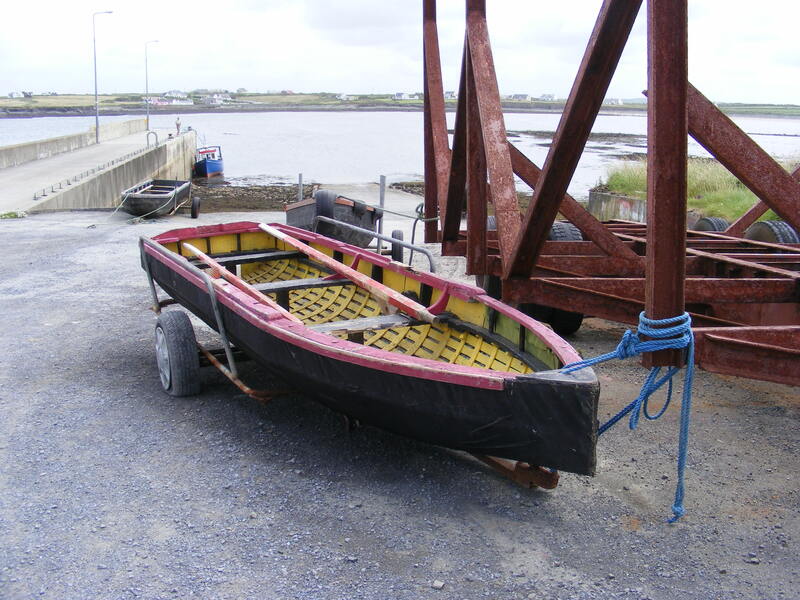 While we saw no fishermen in their boats, we did see some fishing boats that reminded us of the boats from The Secret of Roan Inish. After Doonbeg we drove down the coast to a town called Kilkee. 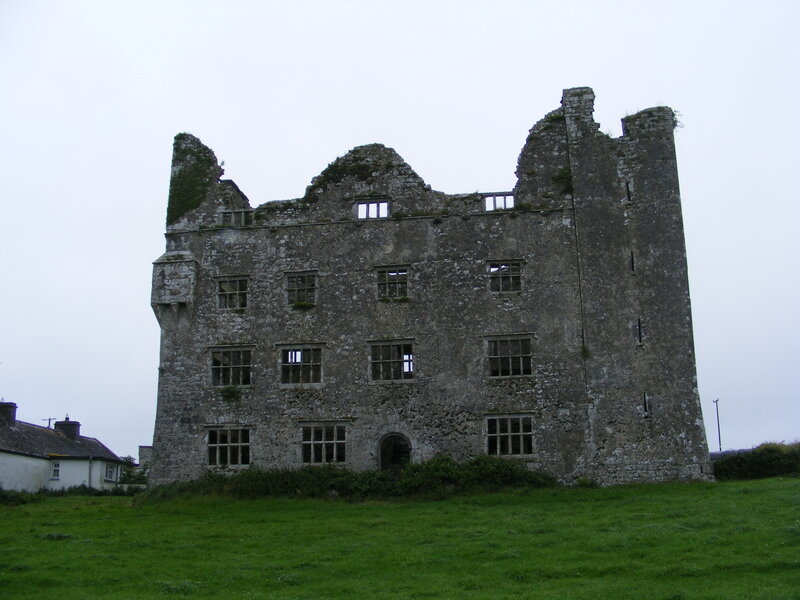 We’d seen it when we first got to County Clare. It seemed like a crowded and tacky holiday town — a place I’d wanted to avoid. 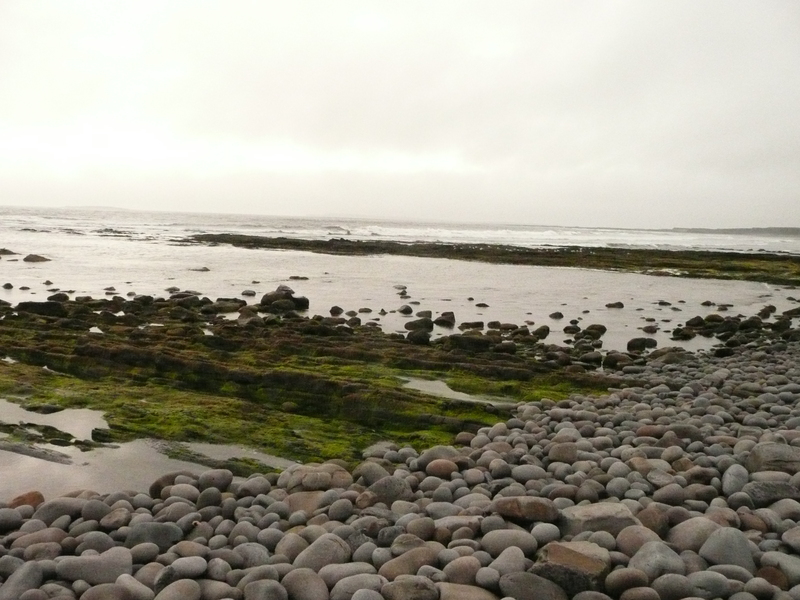 I was hoping to spend only an hour or so there, but after taking a walk along the sheltered, but dirty beach Dean and the kids found some rocks on which to climb on. They got dangerously close to the sea while huge waves crashed just below them. Clare and Andrew also found holes in the rocks and climbed into them. The crashing waves were a beautiful turquoise color. Had I researched the town before visiting, I may have forgiven its current appearance had I known more about it. It was a Victorian seaside resort and had been visited by several famous people including Che Guevara and Charlotte Bronte. Richard Harris owned a house there as well. After an expensive and disappointing lunch (at a bar that claimed to have lodged Che Guevara) we drove along a route called Loop Head. The views from many points along this route were spectacular, and in my opinion, were more impressive than the Cliffs of Moher. 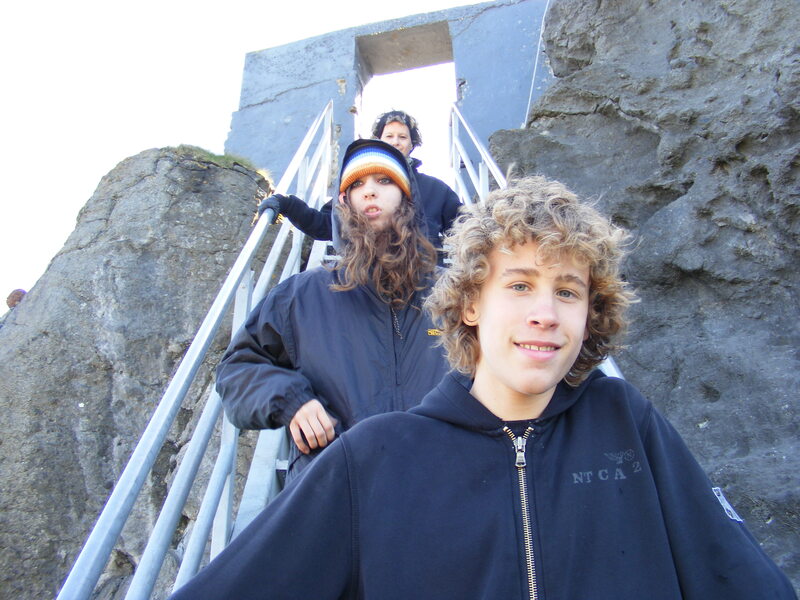 Of course the kids had to push the limits and get close to the edges of the sea cliffs. On one spot we saw a lot of people with fishing rods walking over a hill. I kept to the inside, away from the edges of the cliffs, but Dean and the kids took a more dangerous route near the fishermen. 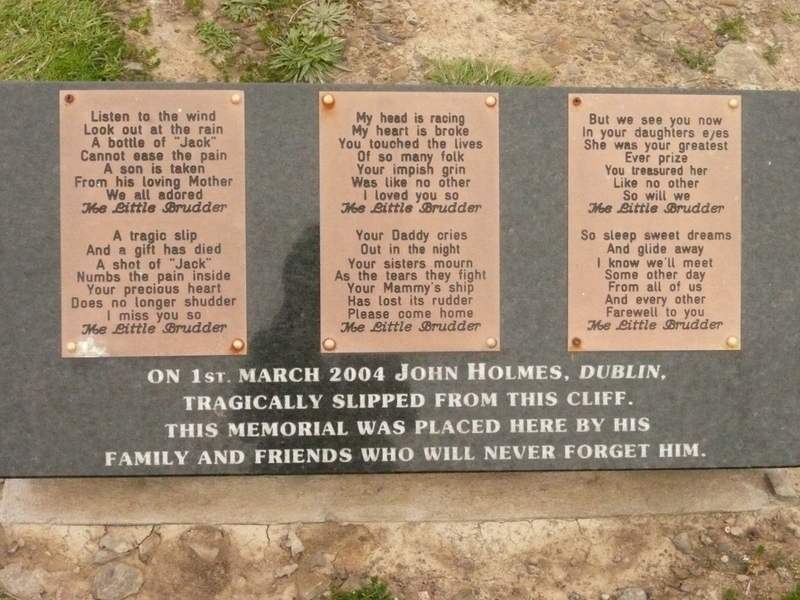 I went back to the car which was parked next to a comforting memorial to a man who fell off the cliff. 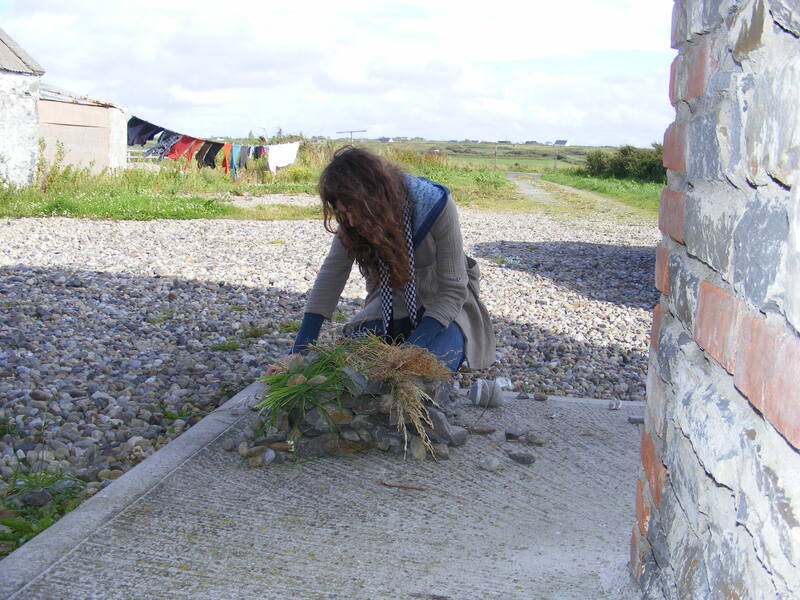 While I waited for my family to return, I wondered if I’d put a memorial up for them or not. I also wondered how I’d get back to civilization since I had no idea how to drive the car. 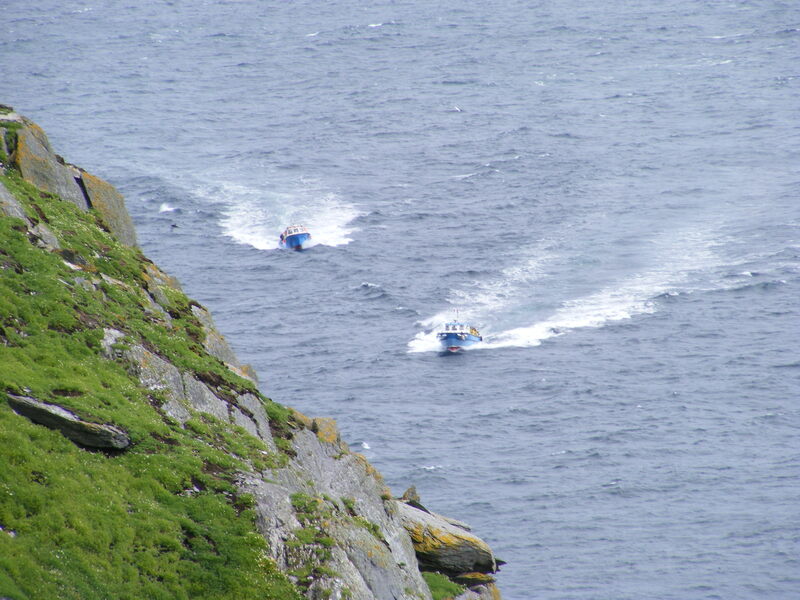 I was very happy to see them when they finally did come back away from the edge of the cliffs. The route takes you to a lighthouse (that it seems you can rent). I’d heard the birds were interesting by the lighthouse, so I made sure to have my binoculars handy. I didn’t see any unusual birds, but there were a lot of them. Loop Head isn’t that far of a drive, but the roads are so small it takes a long time to complete. We were ready to go back to our cottage and play some more games and have an easy meal of spaghetti. More Day 12 photographs on Flickr. 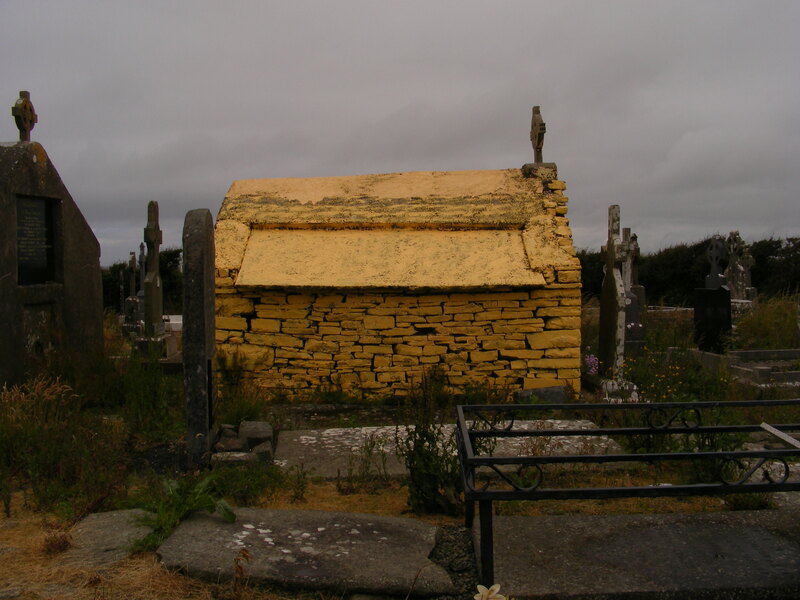 This morning we decided as the sun was peeking out a bit, we should visit the Cliffs of Moher, but before we visited the cliffs we paid a visit to a nearby burial ground. 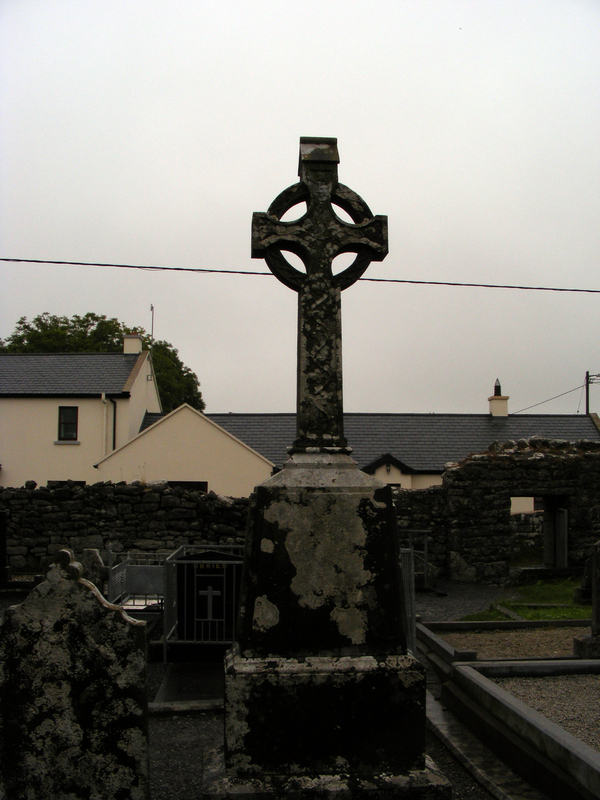 Graveyards are striking here — old Celtic crosses and usually a building, often in ruins share a bit of land with newer gravestones — some of which have photographs on them. The one we visited had all three and was worth the visit. On the way to the cliffs, along the coastal route we were stopped at a hairpin turn behind a tour bus that slowly made the turn and ended up in the opposite lane. 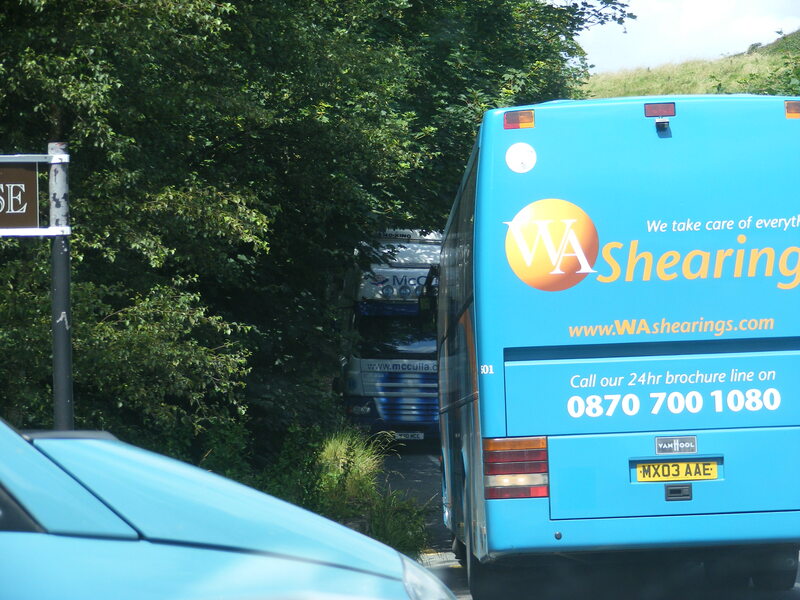 I wondered aloud what would happen if two tour buses met on a curve like that when an articulated lorry came from the other way. I found out what happened when one unmovable force met another unmovable force — traffic jam! 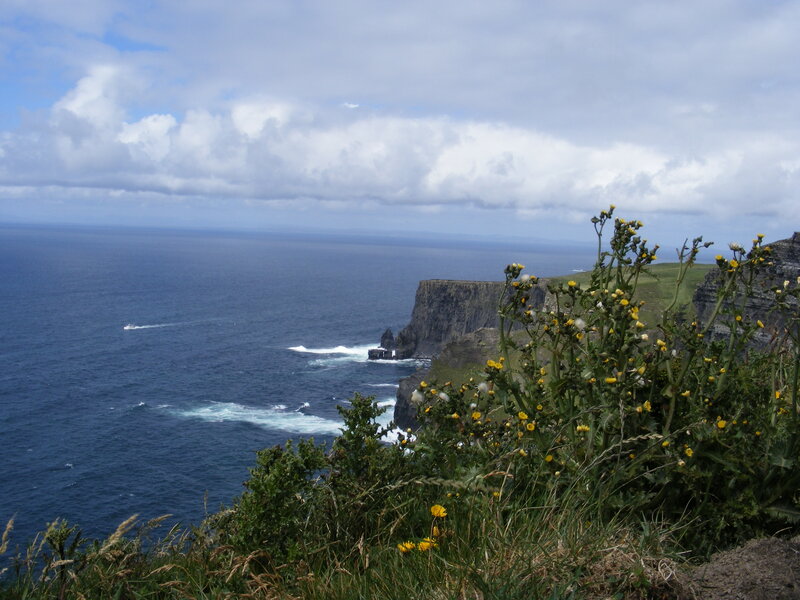 The Cliffs of Moher is one of Ireland’s leading tourist attractions. Dean and I had been there before — in 1985 when we toured Europe for our honeymoon. I recall not being terribly impressed with them — Dean said perhaps I was jaded from the tour bus ride. Dean remembers being scared when we visited, fearing someone would fall over the side. The attraction is much different now than it was 23 years ago. A visitor’s center has been built into the hill so you don’t really notice it until you’re right next to it. 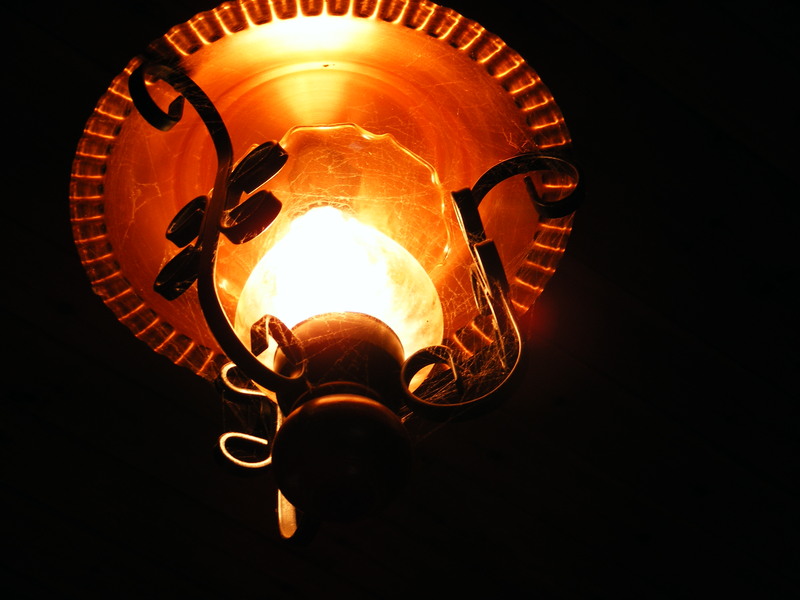 It is quite tastefully done, and possibly the most interesting thing about the attraction. Safety walls have been built up so one would really have to work to fall off the cliffs. Steps and ramps have also been built. We snapped a few photos of the cliffs, etc. and toured the visitor’s center. I wish I could say it was worth the time and money spent, but I really can’t. Andrew was a little disappointed I was not excited, but in all honesty, I think he liked the visitor’s center best anyway with its interactive exhibits. When we returned home I did some laundry. Irish washing machines are different than the machines I’m used to in the States. For one thing, the washer and dryer are often the same machine. For another, the clothes don’t actually get dry. I guess, if you keep drying the clothes they’d eventually dry, but after a couple of hours it begins to get old. I ended up usually hanging the damp clothes over the radiators, or when the weather was decent I hung them on the clothesline. 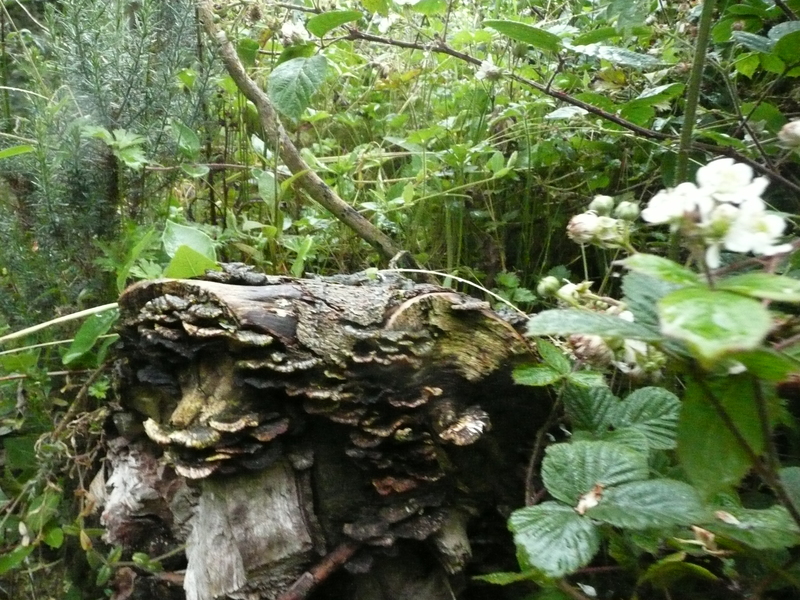 Clare constructed a fairy house outside the cottage, complete with a thatched roof. She also left some milk out for the fairies. They ended up repaying her for her thoughtfulness. While I cooked dinner Dean and the kids played cards in the sun room. The three of them often played gin rummy during quiet times. I joined in occasionally, but I’m not really a card game fan. 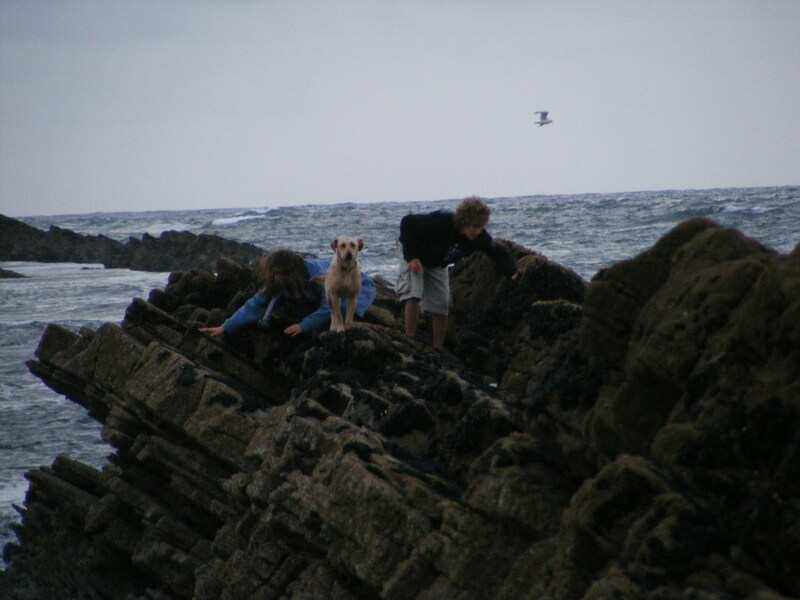 That evening, after a meal of pasta we spent a while at the rocky beach again — the kids looking at tidepools and playing with a friendly local dog. More Day 11 photos on Flickr. This morning, after a good night’s sleep and a hearty breakfast of porridge, we headed to the Burren, a desolate part of County Clare known for lots of rocks, wildflowers and burial tombs. We stopped off at the Burren Centre in Kilfenora and paid €5 a person (roughly $7.25) to tour the small museum and view a 12 minute video about the area. After the Burren Centre we paid a brief visit to Kilfenora Cathedral where we saw some impressive stone crosses in the graveyard there. 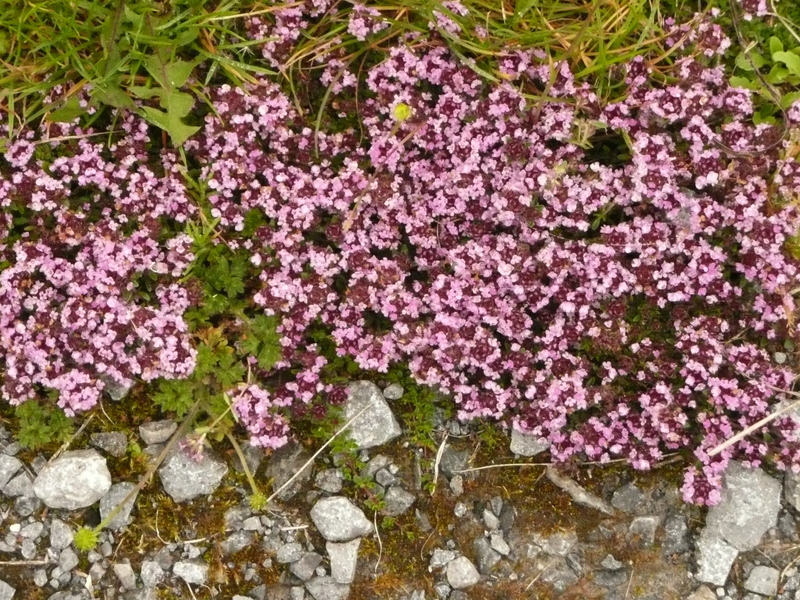 We then began our drive through the Burren, wondering when it would begin to look desolate. We stopped at Leamanagh Castle along the way and took a few photographs there after parking precariously close to the road. According to several websites you’re not supposed to go into this building because it is on private property. Oops! 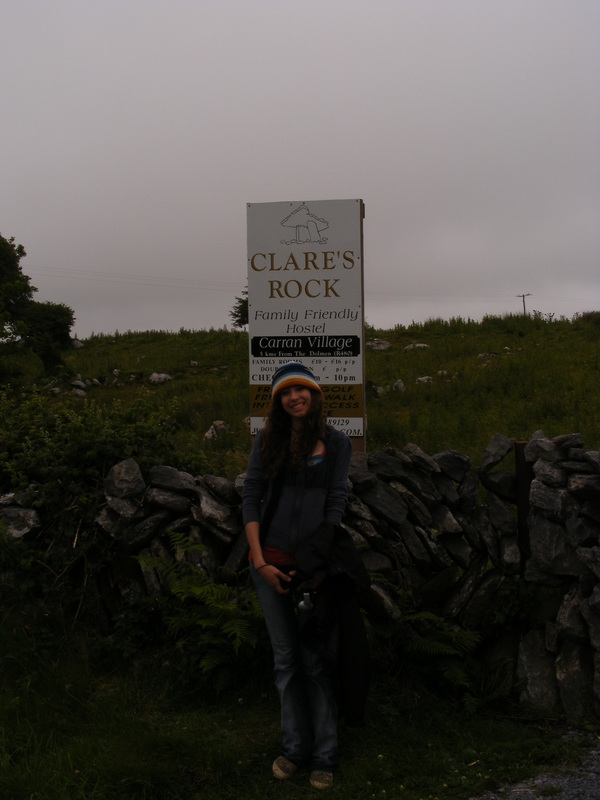 After trespassing in visiting Leamanagh Castle we drove a few miles along our route and stopped at the Poulnabrone Portal tomb site, which had a sign close by advertising Clare’s Rock Hostel.Yay, another photo opportunity with our very own Clare! We spent a good deal of time exploring the [now desolate looking] vicinity of this portal tomb. The wildflowers were amazing in that they seemed to be growing with little or no soil. 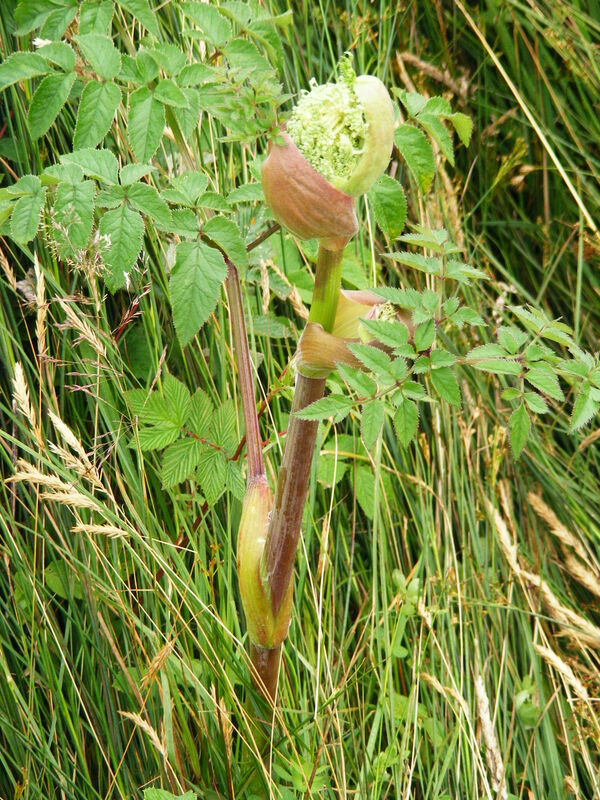 There were many different kinds of flowers as well. Dean and the kids went off to explore another part of the area after we had a lunch of bread, cheese, chocolate bars and Club brand soda. We snapped many photographs here as well. After exploring the site of the portal tomb, we moved on further into the Burren, marveling at the stark beauty. 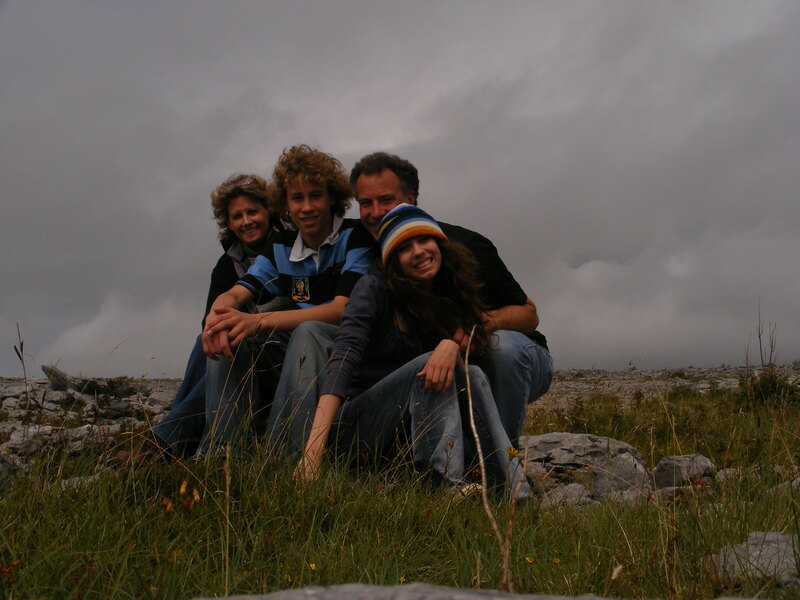 We stopped for a family photo once, then carried onto Ballyvaughn, a town on Galway Bay. 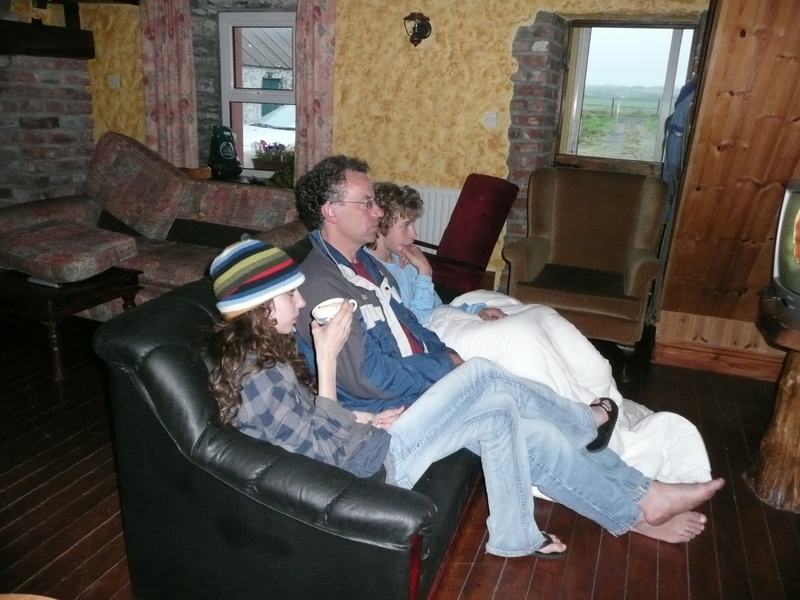 We drove home along the Coastal Road through Doolin — the capital of “Trad”. I’d read that people come to Ireland just to come to this town. We were underwhelmed with what we saw of the town, but the music was probably worth coming back to. 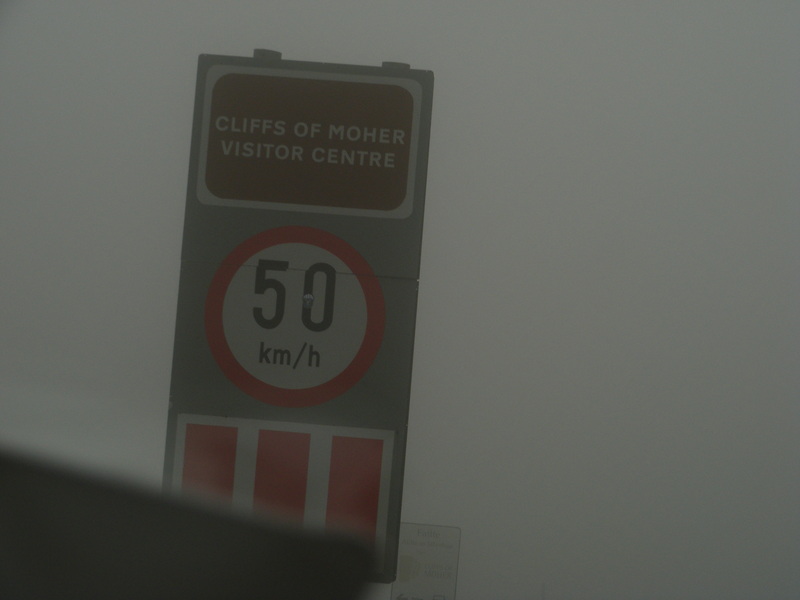 We thought we might stop at the Cliffs of Moher, if the weather was clear, but when we got there a heavy fog had rolled in from the sea. We estimated the visibility was less than 100 feet at times. Needless to say we decided to visit the Cliffs of Moher on another day. Back at home we made a meal of beef stew braised in Guinness. Dean and I popped out to the pub. We tried O’Looney’s but it was closed. It also looked a bit scary and wondered at Gregory’s recommendation of it. We drove onto Walshes Bar in Creegh. 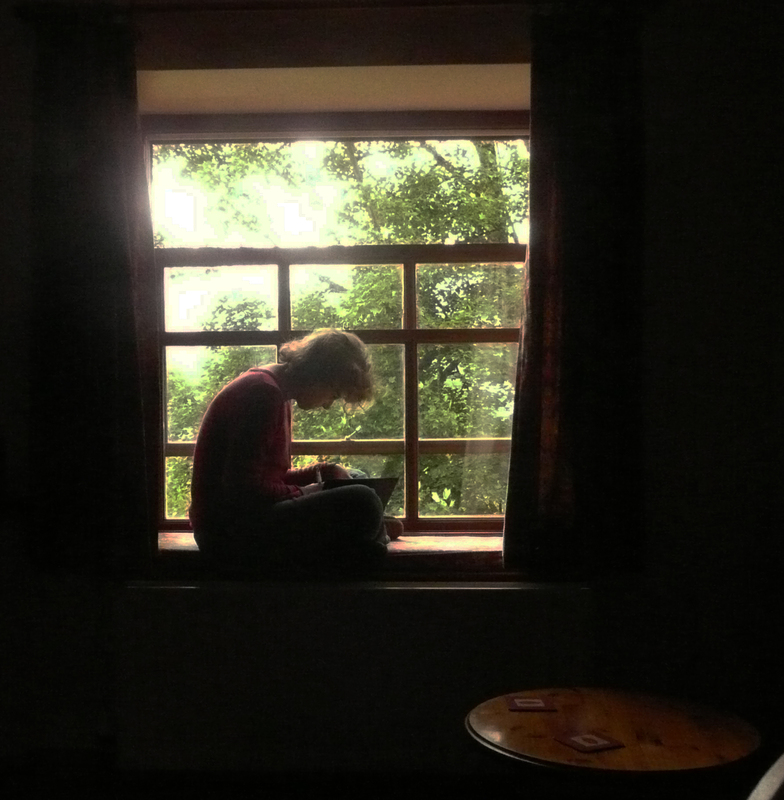 It was a tiny, cozy place that suited us just fine. We noticed a sign in the window advertising Trad on Thursday and we planned on returning for the music. We had a conversation with a local farmer whose dog approached us for attention. After dinner Clare, Andrew and Dean went to the beach and I walked there to join them. The walk was not as long as I’d expected, but I still think Gregory should have warned me it was not a short walk, but a long one, when he emailed me about the cottage. 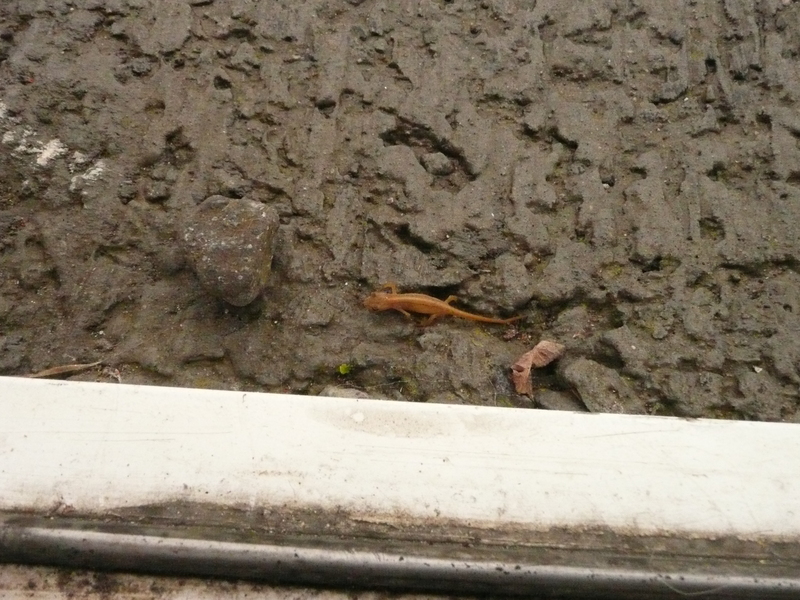 I forgot to mention that, not only do we have spiders living with us, we also have tiny newts in residence. While using the bathroom this morning I saw an orange colored critter on the bathroom floor. I picked it up and put it outside, but not before taking its photo. I thought St. Patrick took care of this kind of creature in Ireland. The newt was so tiny (about an inch long), I’m wondering if the spiders eat them too. After researching newts in Ireland, it seems as if the newt I found is not a native. I wonder how he got there then. 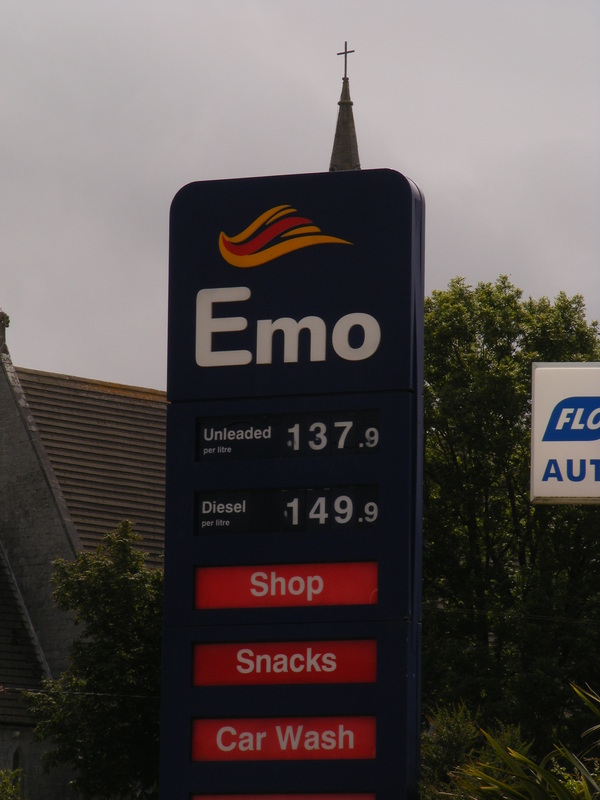 Oh, one more thing…we are getting a kick out of the name of one of the petrol stations in this country. We made silly jokes about only goths going there, etc. It doesn’t take much to amuse us, does it? …and if you are wondering — the price of petrol when we were there was about €1.39 a liter (or about $2 a liter). If there are 3.79 liters in a gallon, then that would make the petrol about $7.50 a gallon in Ireland. And we complain about the price of gas here! More day 10 photos on Flickr. Today we drove to Ennis to buy more groceries. Ennis is a market town and the largest town in the area. 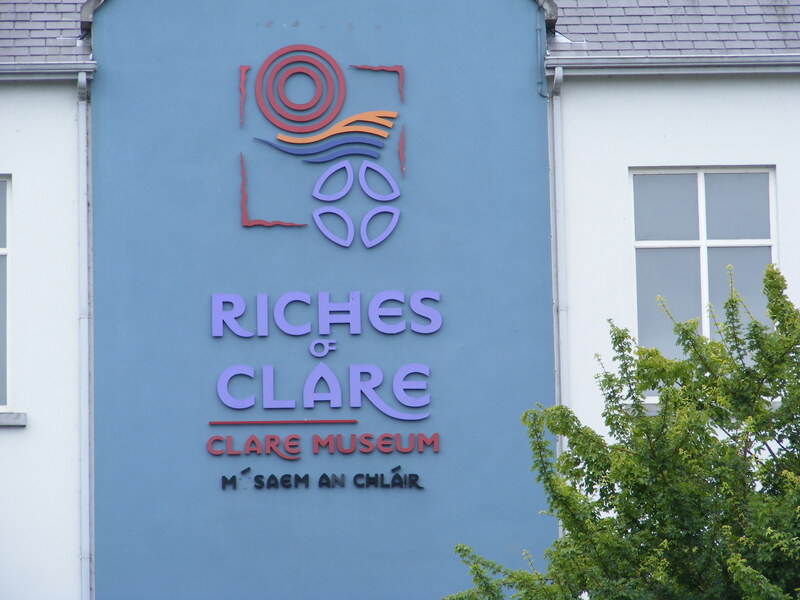 We also visited the tourist information office, hoping to visit the Clare Museum. No luck — on Sunday it closes at noon. Outside the museum we met an ex-pat from the States who seemed to have picked up the loquaciousness of the Irish by association. She told us pretty much all there is to know about her life, but she also gave us some ideas on things to do in the area. 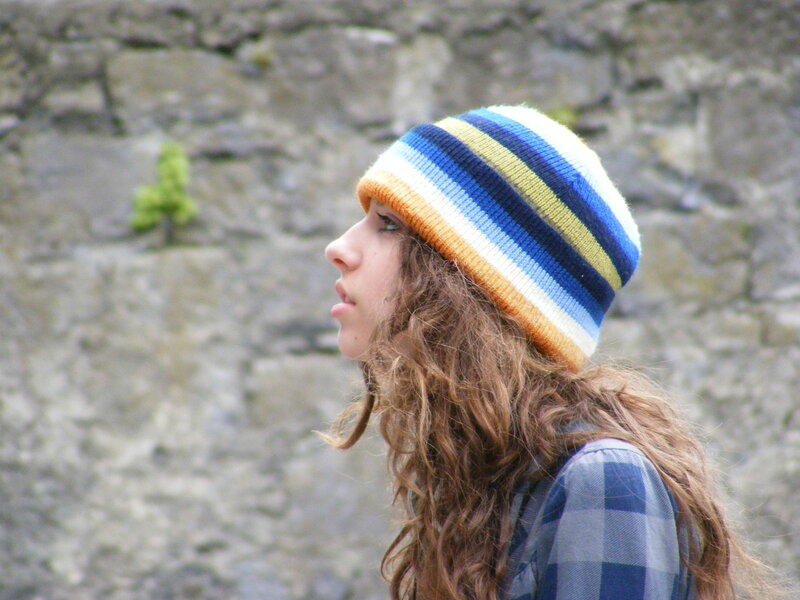 It’s almost jarringly painful to hear an American accent while in Ireland. After the tourist information office, we walked around Ennis for a while, taking some photos. 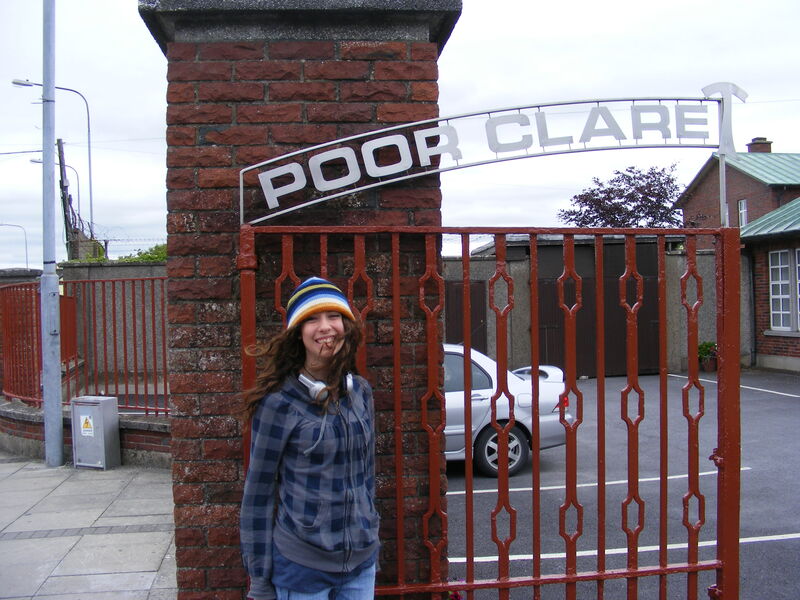 We probably went overboard, teasing Clare about being in COUNTY CLARE. I think she got the point. 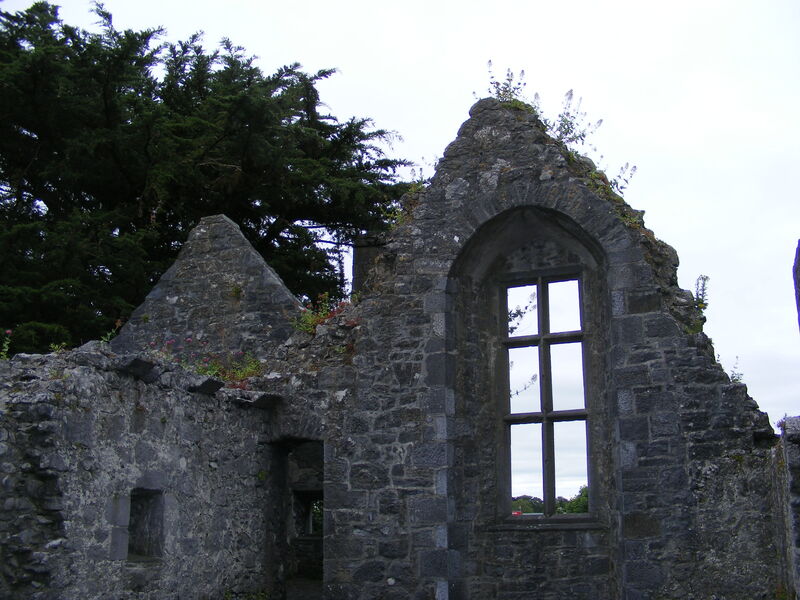 We then visited a 13th century friary, a bookstore and then found a pub/bar with food and ate lunch. 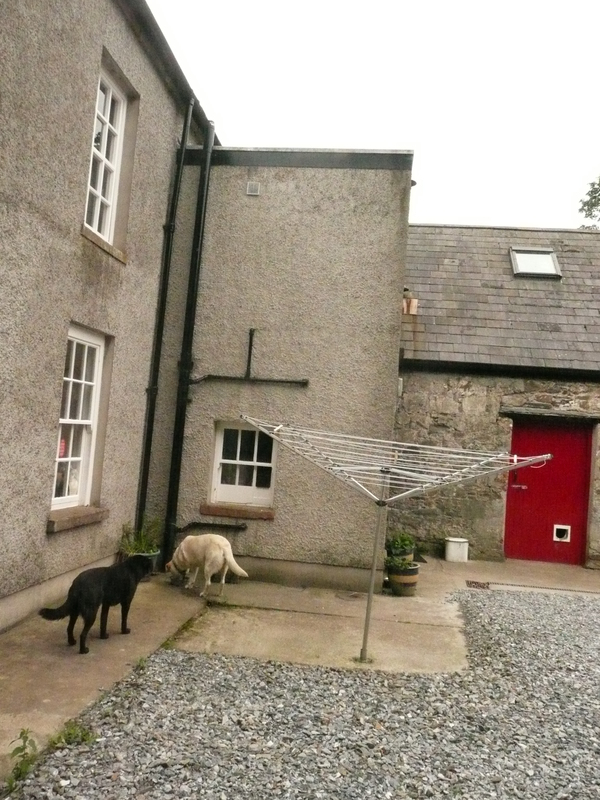 Finally, we bought groceries and drove back to Parkduff Cottage. Back at Parkduff Cottage we built a [smokeless] peat fire and made dinner. Gregory, the owner of the cottage stopped by to make sure we had settled in. We requested some more peat and more towels (we only had 3 when we got there). He told us about some places we should visit, including a local pub called O’Looney’s. After dinner we watched a little television and then went to bed. More day 9 photos on Flickr. This morning we got up around 7 am so we could leave by 8 and get to Portmagee by 10 am. 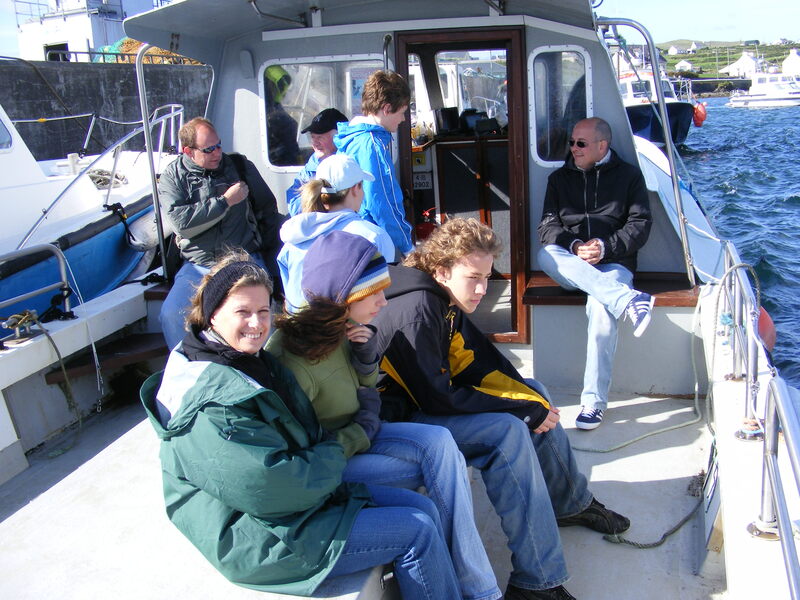 Dean had arranged transport to Skellig Michael on Wednesday — our hosts let Dean use their telephone and found us a lot of information about the trip such as the best place from which to sail and the best transport companies. 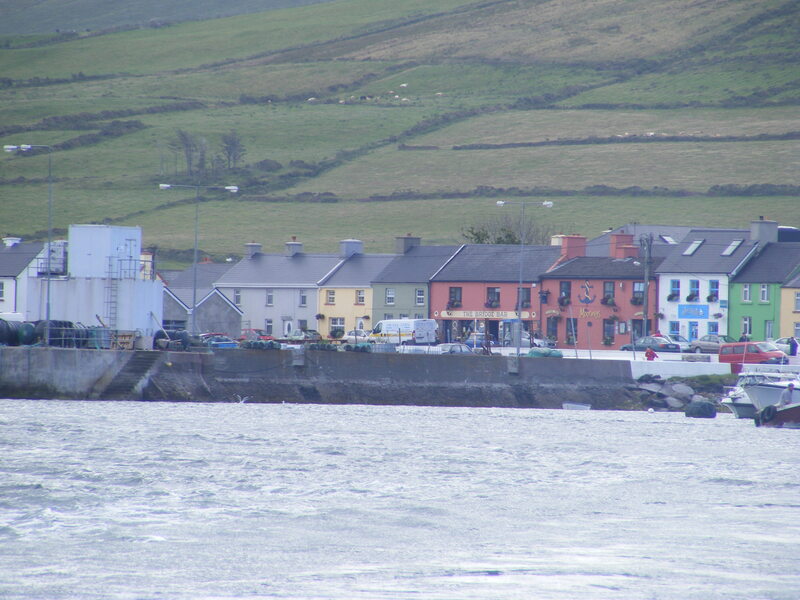 The drive to Portmagee from Firies is the northern section of the Ring of Kerry. 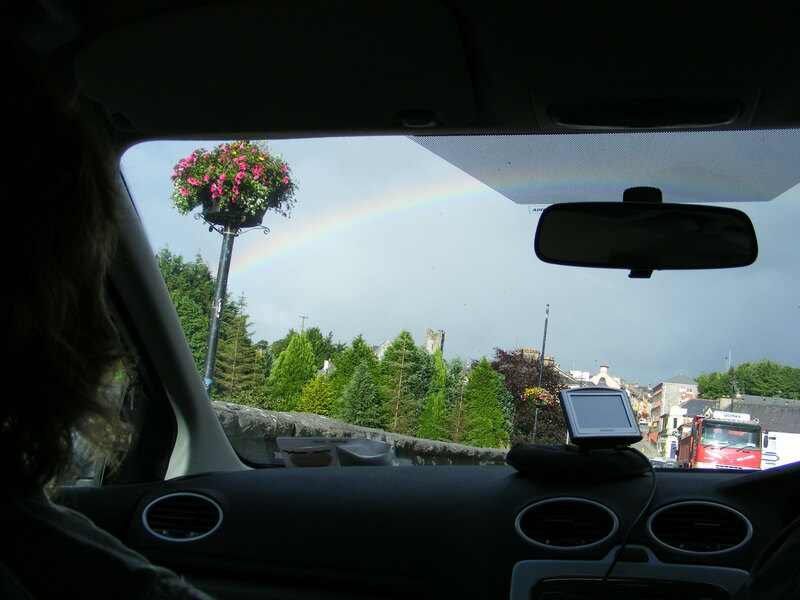 The views were spectacular — we even saw a rainbow, but not more than much of what we’d already seen in Kerry. In fact the view from the upstairs bathroom of our holiday farmhouse is as nice. Joe Roddy himself, the captain of the boat that we’d booked to transport us to Skellig Michael, greeted us as we pulled into the parking lot at Portmagee — a small port town named after one of the most notorious smugglers of the 18th century. It basically consists of a few pubs and colorful buildings in front of a large dock. Captain Roddy shook our hands, assured us it was going to be a lovely day and told us to stay warm in the car for another 20 minutes, then come to his boat. We all donned our foul weather gear, even though the day was sunny and reasonably warm. We knew the air on the sea would be much colder. And wet. I counted my layers and realized I was wearing 8 layers, starting with a Damart long sleeved thermal shirt and ending with a waterproof parka. Then we headed to the boat. 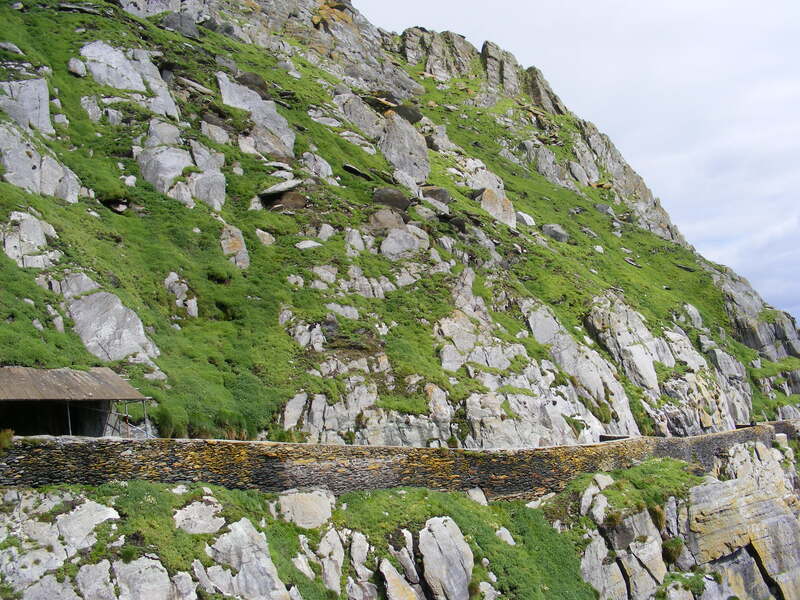 Skellig Michael is a mile wide piece of rock that stands 7.5 miles off the coast of south-west Ireland. That in itself is interesting, but the reason people visit the island is because at the top of the rock stands a very well preserved 6th century monastery. 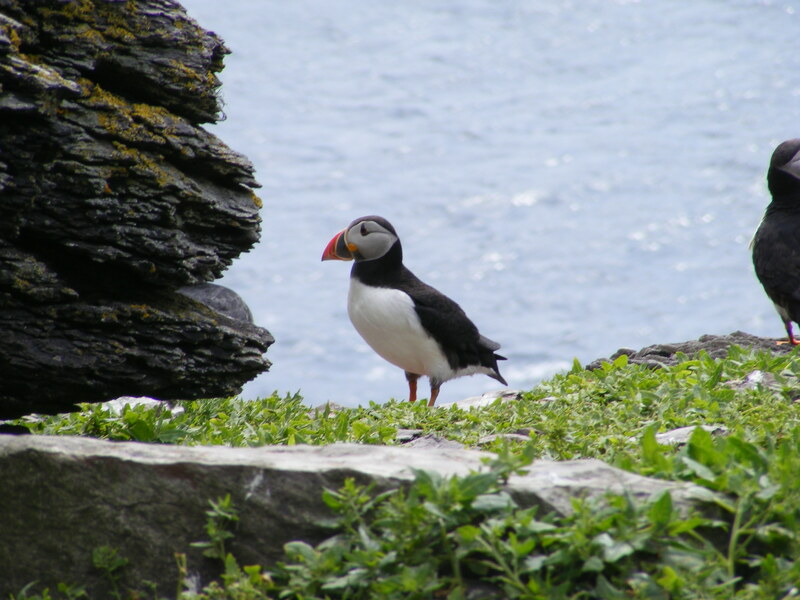 About 15 boat companies are allowed to land on Skellig Michael, transporting about 12 passengers each. 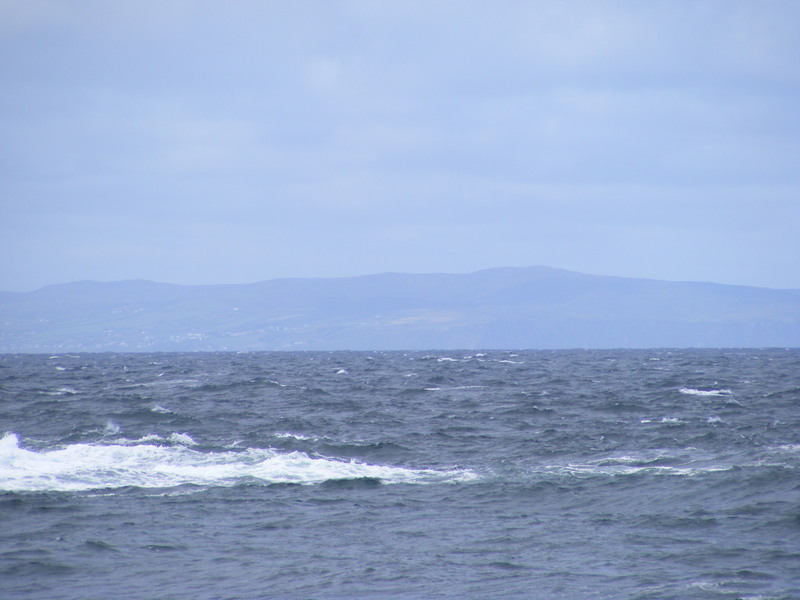 Weather often causes the cancellation of the trip and even on a calm day, like today, the sea is rough. We boarded the boat and Joe Roddy handed out rain gear. I declined mine, declaring, “I’ll be fine.” Mr Roddy replied, “You won’t be fine.” To which I replied, “I have 8 layers on!” He handed the rain gear he was offering to me to someone else and walked away mumbling. Later he came back and gave me rain pants, which I graciously accepted. As we pulled away from the dock, the sun shone down on us, and in my 8 layers of clothing I felt deliciously warm and was confident the boat ride would be a piece of cake. It was a piece of cake at first — no waves, calm sea, little wind. I was ready for this trip. Soon, however, the boat sped up and we were all sprayed with seawater. Up and down, up and down. Splash, splash, splash. We slid around as the boat raced 12 miles over the waves. It was quite scary. After what seemed like forever, riding the waves, the boat docked at a huge pointed rock sort of shaped like the letter M. Up the side of the rock were a set of steep stairs with no railing. I’d about decided not to go up to the top at this point, fearing the steps, but then noticed another path leading around the island, and remembered that the stairs we’d be climbing were not the same stairs as the one the monks climbed. Joe Roddy informed us that he’d be back to pick us up in 2.5 hours. We removed our loaner gear and as I handed my rain pants to the captain he smiled and said, “You’re the one who wasn’t going to wear these,” and I replied that I was glad he insisted I wear them. Clare and Andrew were out of the boat and on the island ahead of us, but we met up with them as soon as the puffins were visible. 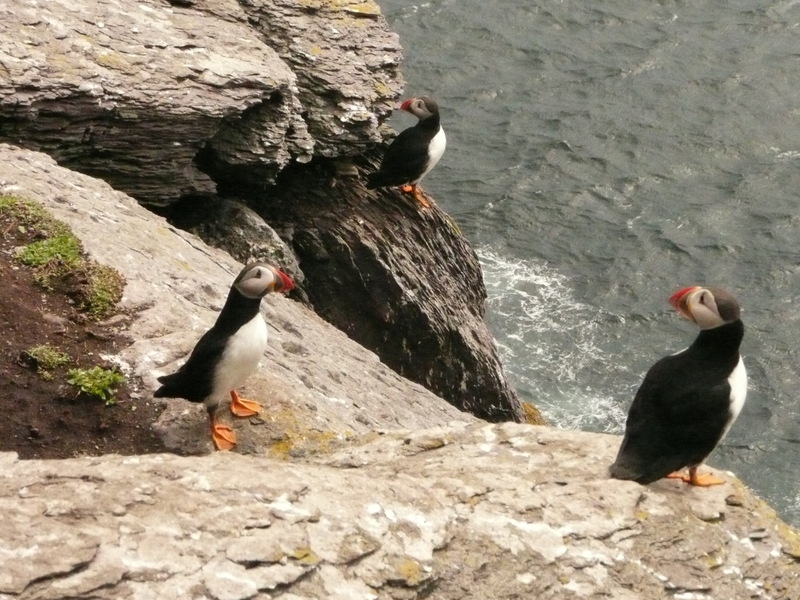 Hundreds of seemingly tame puffins stood around on the rocks and vegetation. 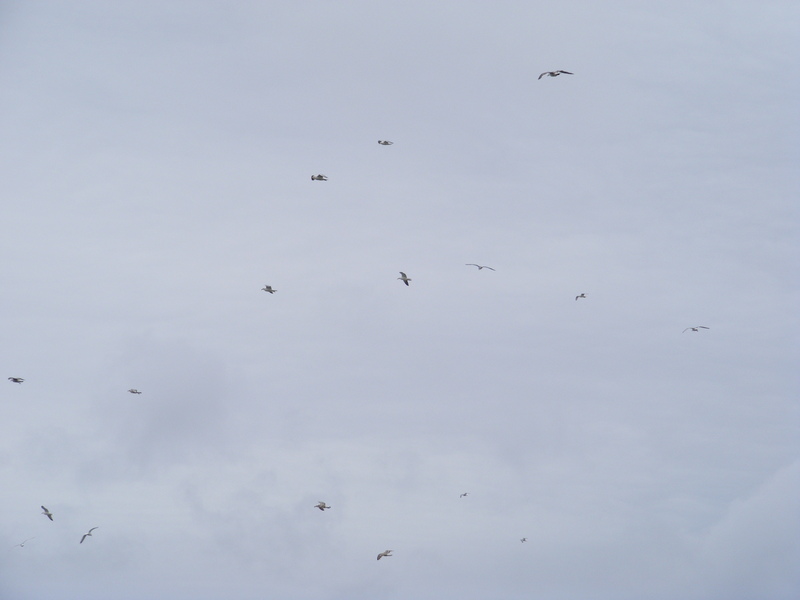 Others flew overhead and below as we walked up the stairs. While these stairs seemed safer than the ones I’d seen earlier, it was still a struggle to keep going sometimes. I had to not look over the side, as much as I wanted to see the flying puffins. 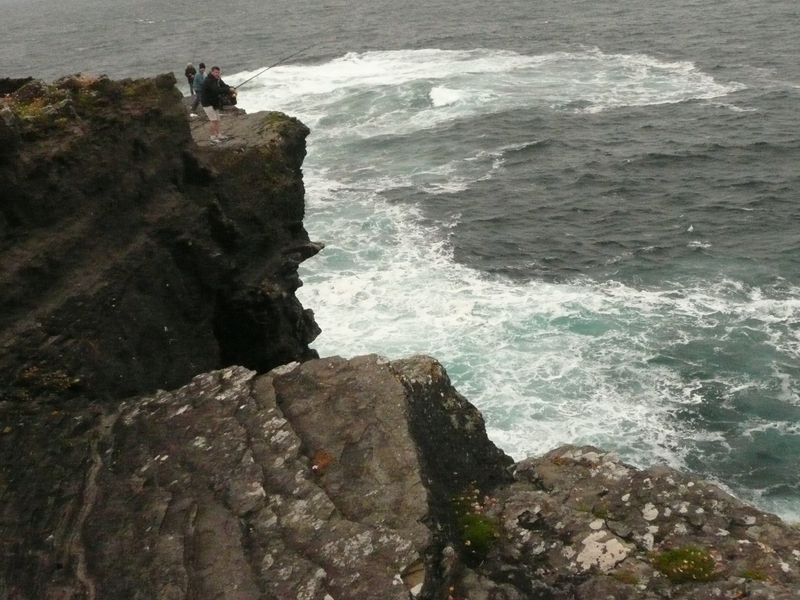 There were few railings, and huge drop-offs to the sea, hundreds of feet below us. 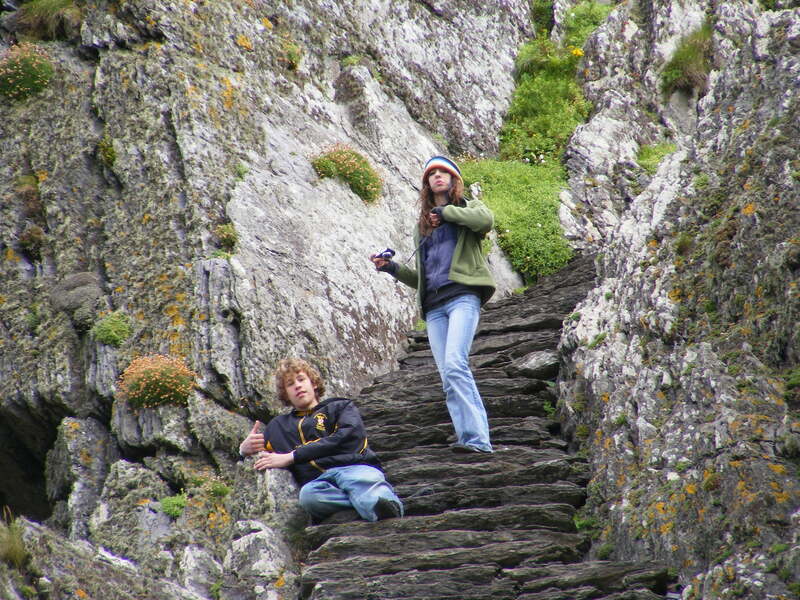 I was glad Andrew was out of his clumsy stage, but didn’t give much thought to where the kids were — I was too concerned with putting each foot in front of me for the 600 or so steps to the top of the rock. When I finally reached the monastery, I wondered why I’d been worried about the difficulty of climbing up 600 steps. I should have been worried about falling off the top of the 600 steps. 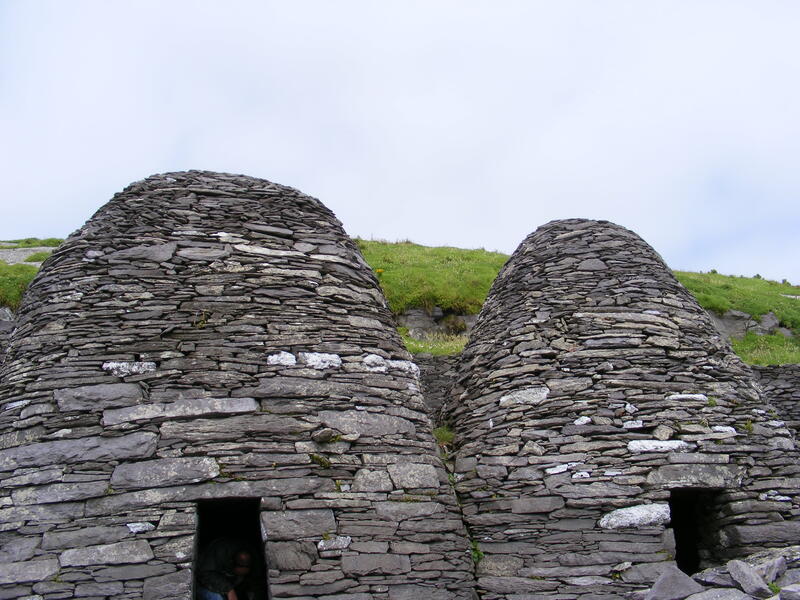 Several “beehive” huts, some dry-stone walls, a graveyard and a vegetable garden stand on the top of Skellig Michael. A very informative docent told us about the monastery and the people who lived there. We walked around and took too many photographs. It was so worth the boat ride and the walk, being in this ancient place. The boat ride back was actually worse, but I was less scared. 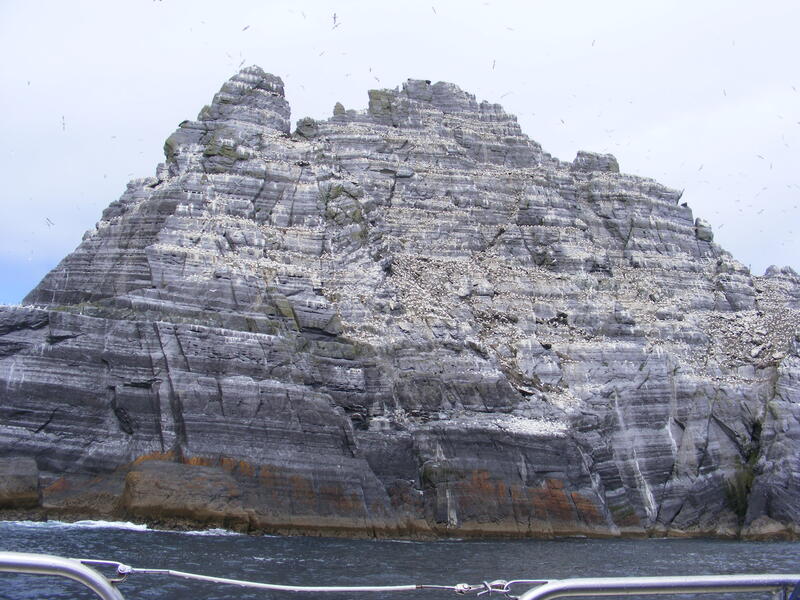 We stopped at the smaller Skellig Island — this one is a gannet sanctuary and is white with smelly bird guano. Back at Portmagee a flying bird gave us a welcome back package in the form of a poo. We drove home and when we got to the house, Liam’s car was blocking the driveway. 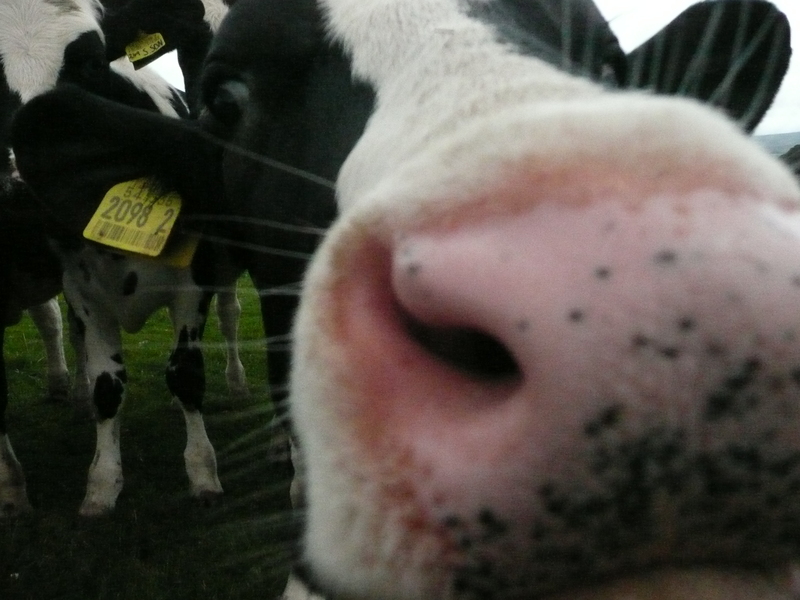 An elderly man in a heavy woolen sweater and wellies walked up to us and explained that Liam was taking the cows to be milked. He told Dean to drive the car into the driveway and then drive our car in afterwords. I talked to him for a bit and learned he was Liam’s 87 year old father. He told me he was born and grew up in the house and that his older brother had lived there and only recently died. He also told me he had another brother who lived in America. Later, while Dean took a nap, Liam stopped by to apologize for leaving his car in the drive. 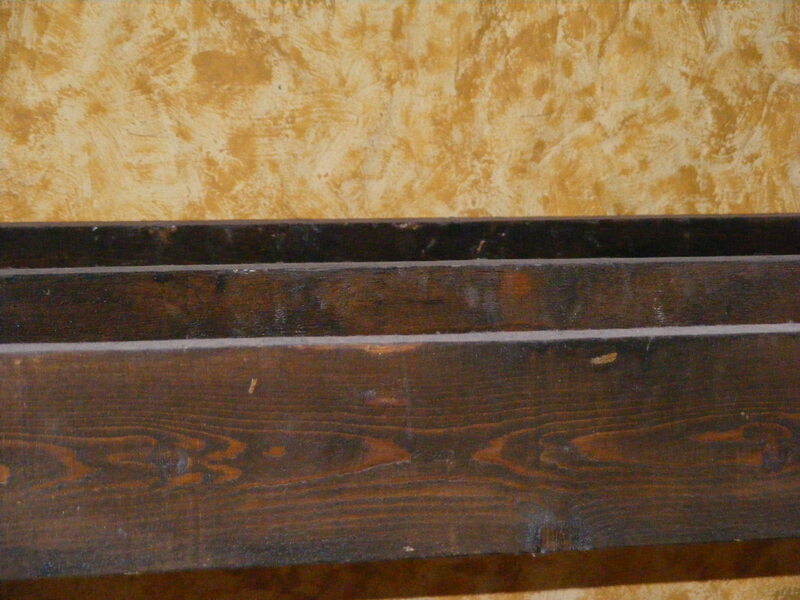 We chatted a bit about our day and Liam told me that he was going to put up some barn owl nesting boxes soon. While I’m sad to be leaving Tralia House, I’m anxious to see our new place. It can’t compare — but will be different — being by the sea. We will rest a little more there as well. More Day 7 photos on Flickr.